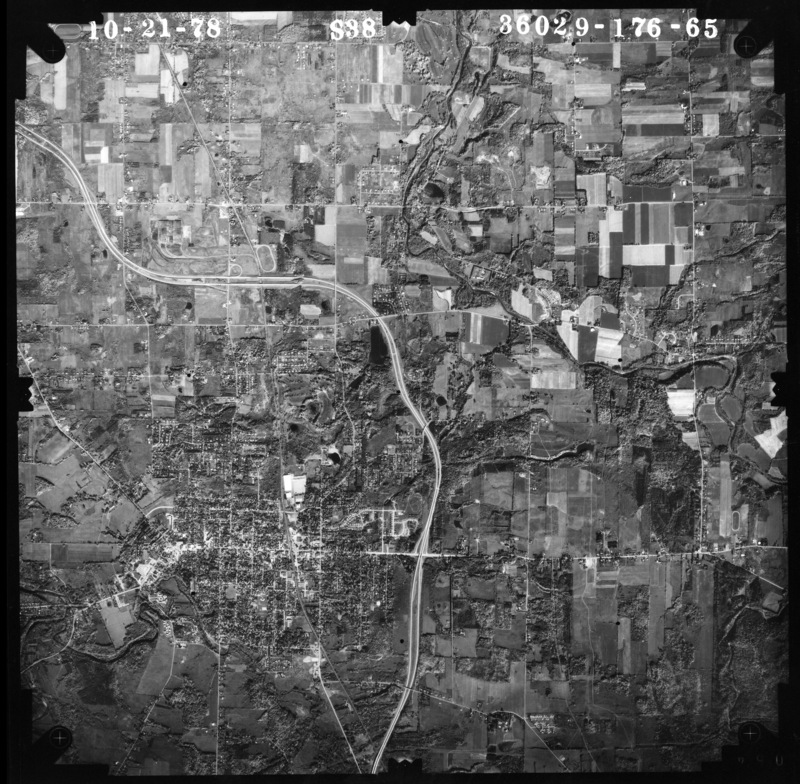 41, 42, 43 Erie County: Wales (N); Holland (S). 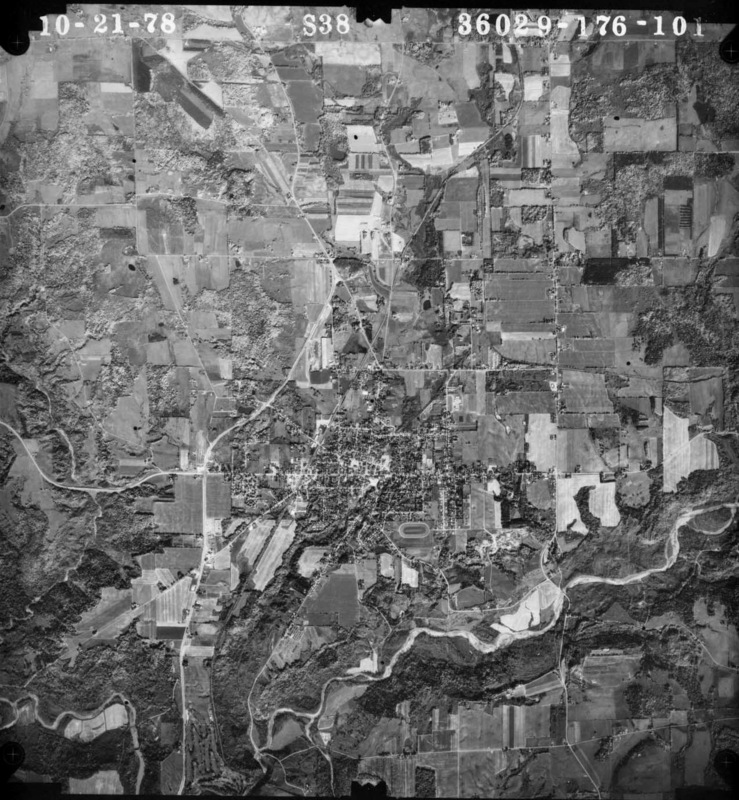 See compilation map. 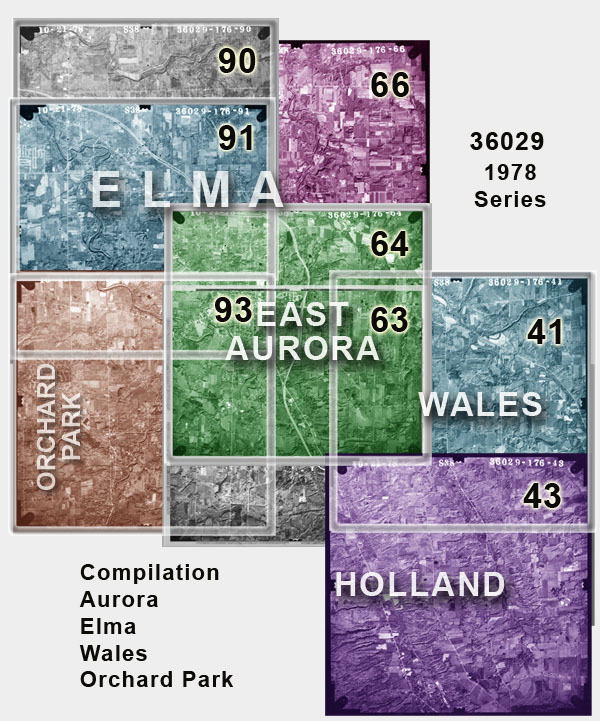 62, 63, 64, 65, 66 Erie County: Aurora & East Aurora, Holland, Wales. 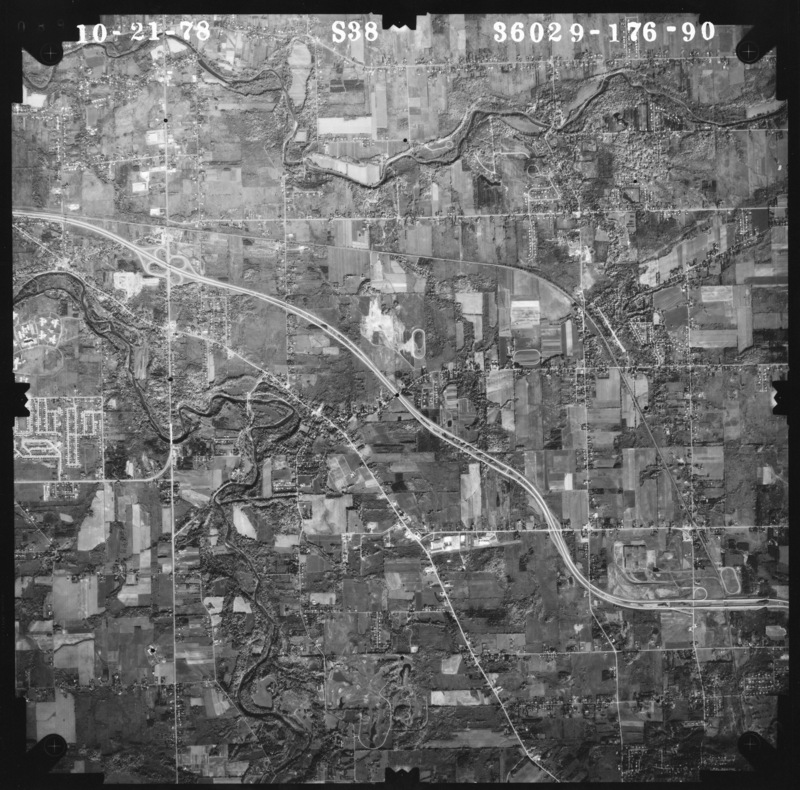 See compilation map. 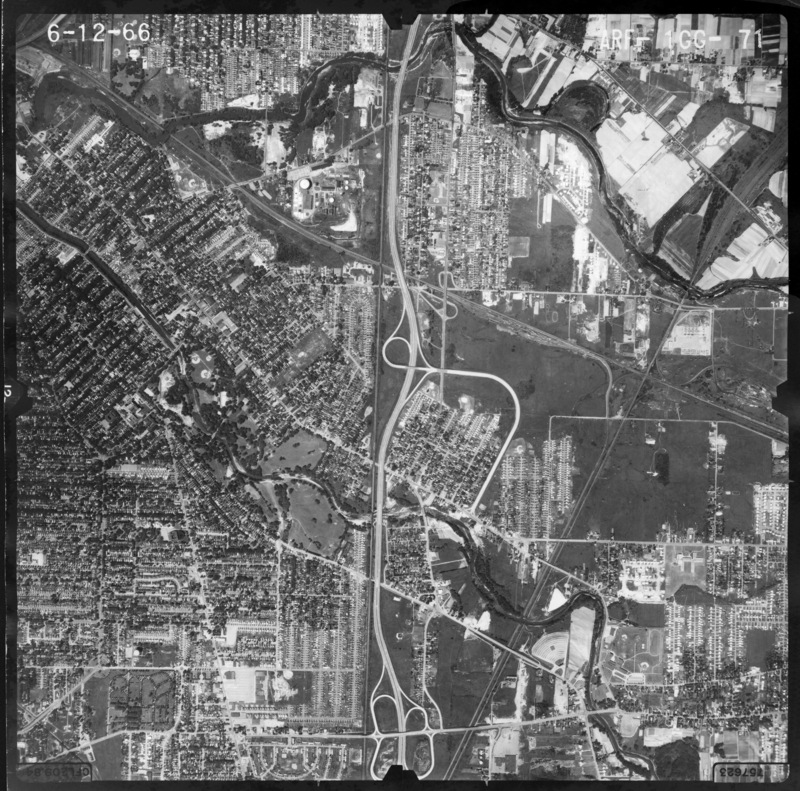 71 West Seneca/Buffalo (SW), I-90-Route 400 interchange. 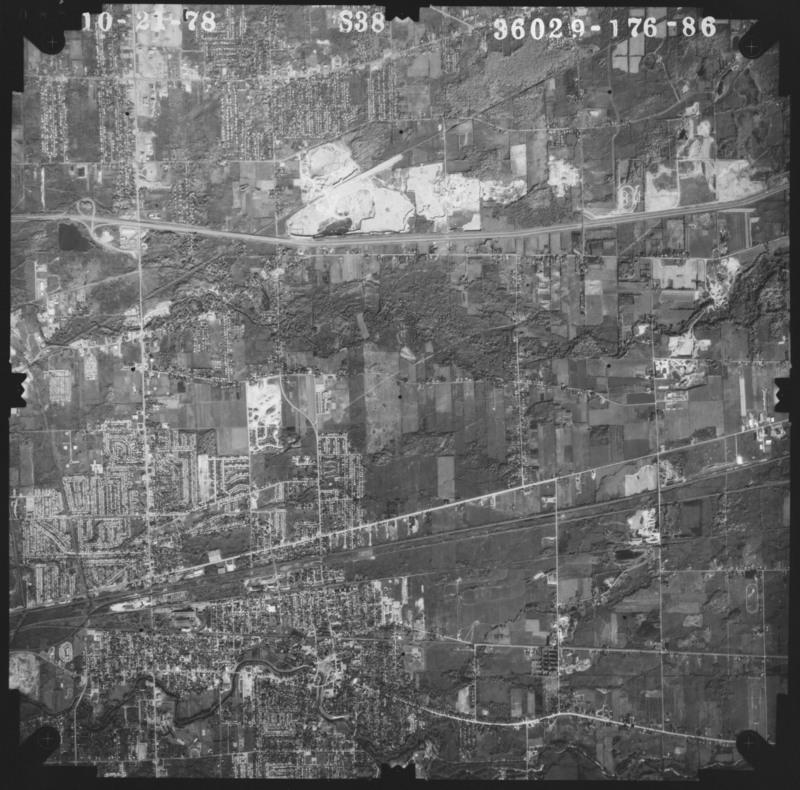 84 Williamsville/Clarence (North of Thruway (I-90), Transit Road (West) to Lancaster. 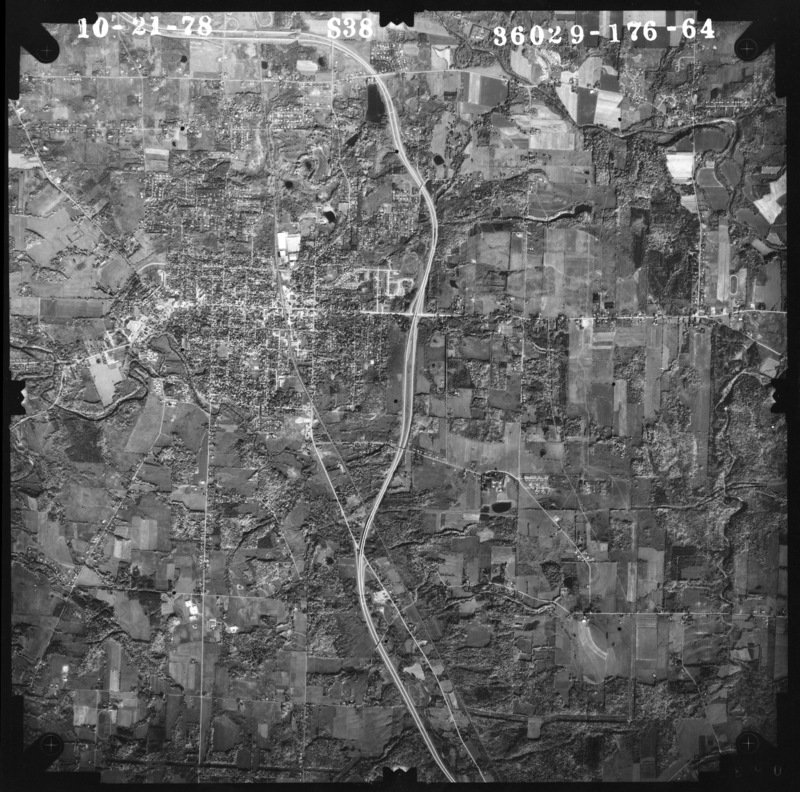 Includes quarries and Lancaster Speedway). 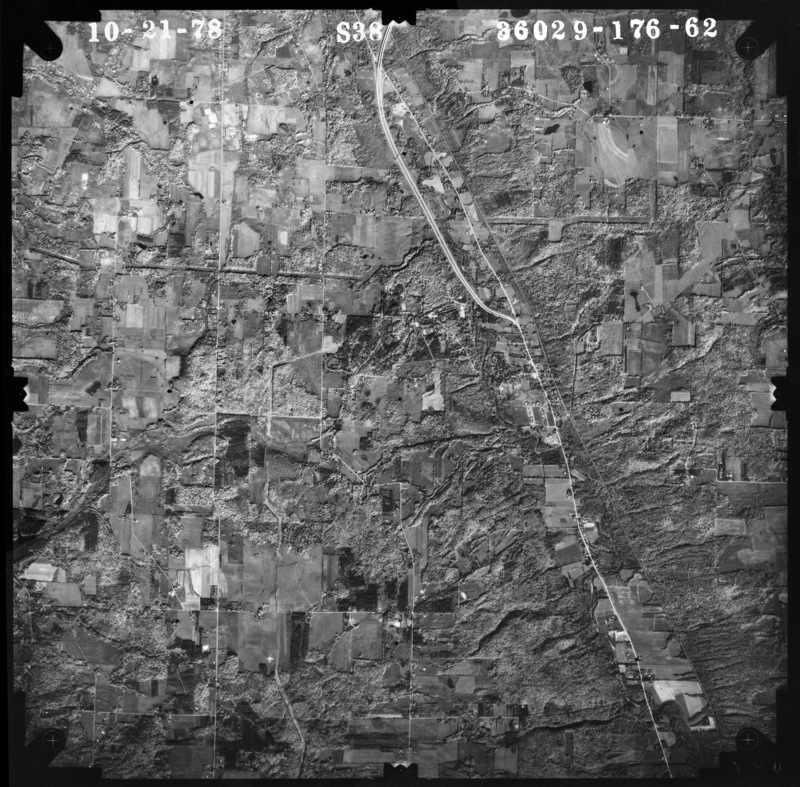 Detail (300%) of Thruway corridor and quarries; from Transit Road to East of Lancaster Speedway. 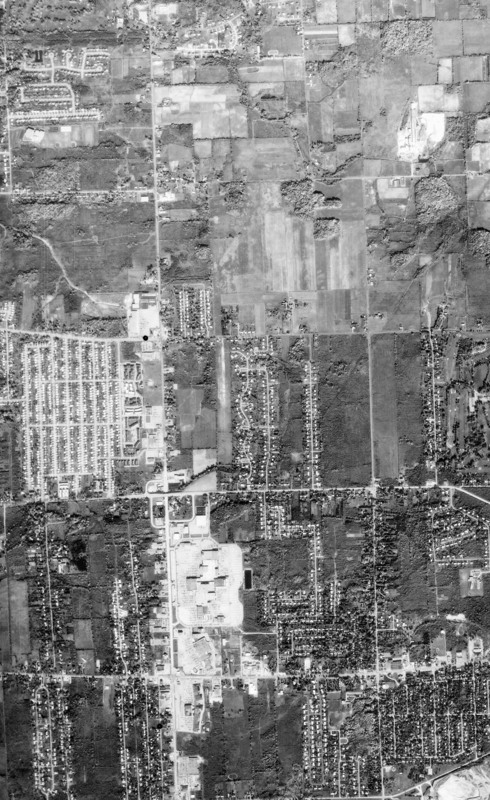 Detail (200%) of Transit Road corridor from Thruway North to Maple Road (current Eastern Hills shopping mall/plaza strip). 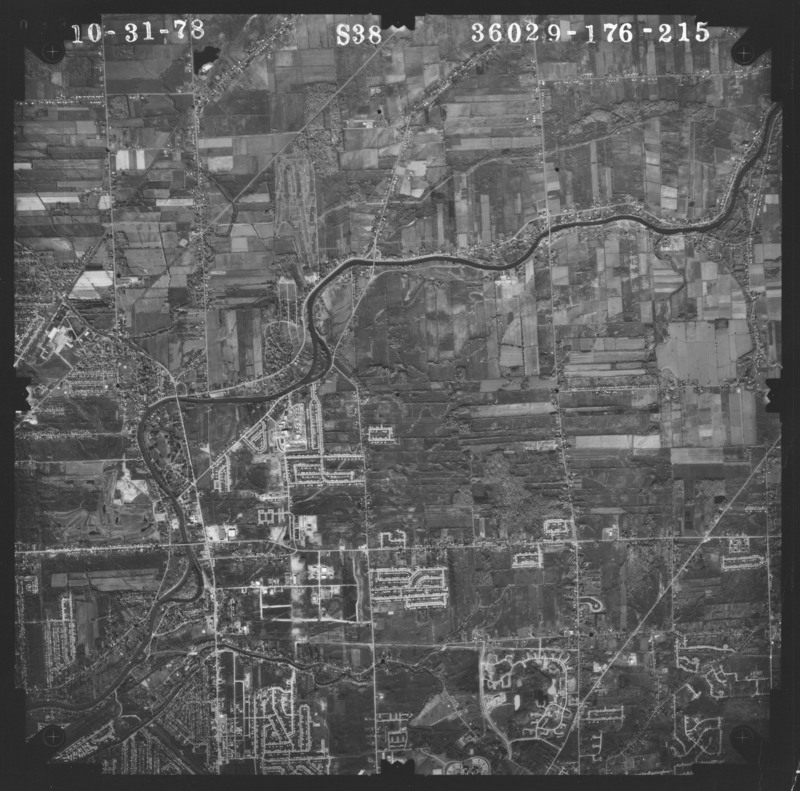 85 Williamsville/Clarence (Image almost the same as 84 above, but includes South of Thruway (I-90) South to Genesee Street; Transit Road (West) to Lancaster. 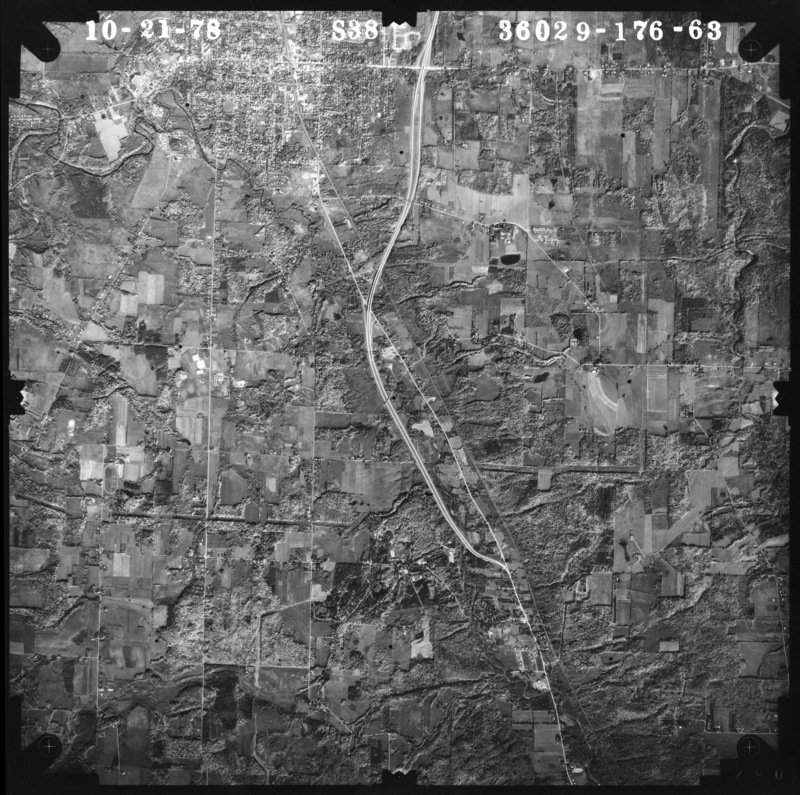 Includes quarries and Lancaster Speedway). 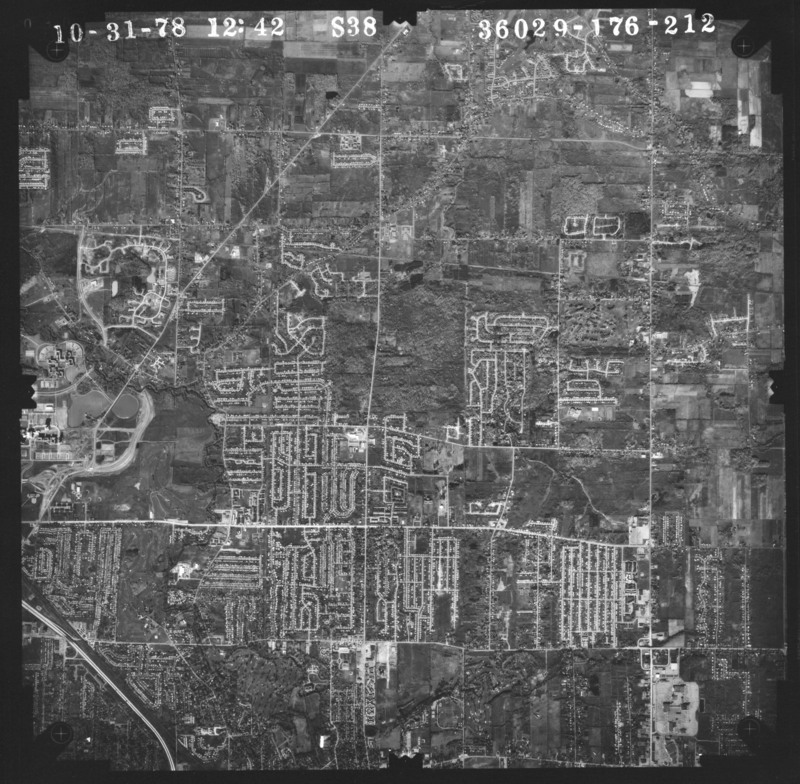 90, 91 Lancaster (N), Elma (Center), Aurora & East Aurora (S); Route 400. 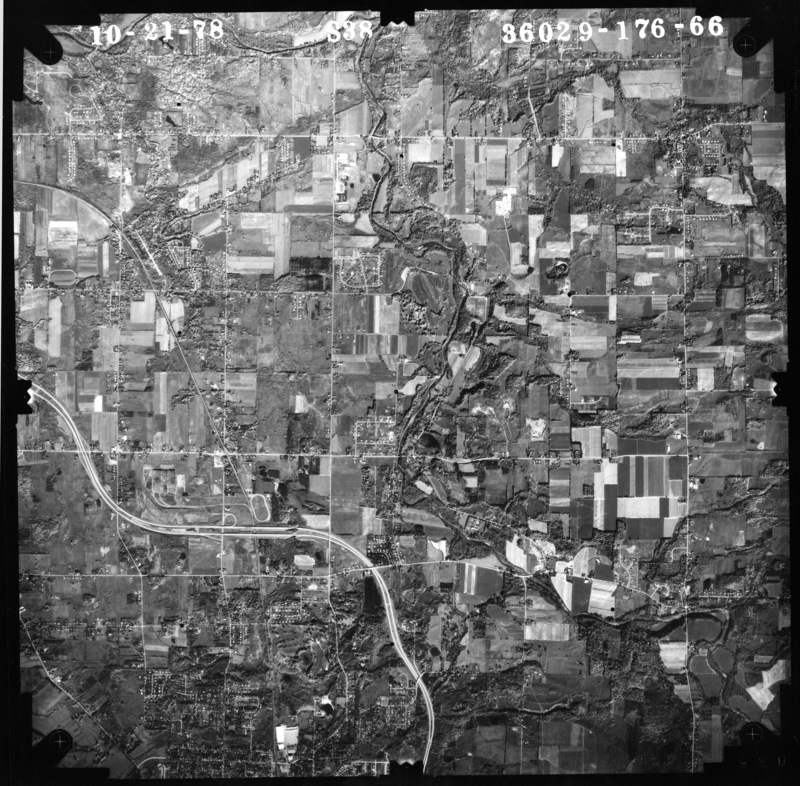 See compilation map. 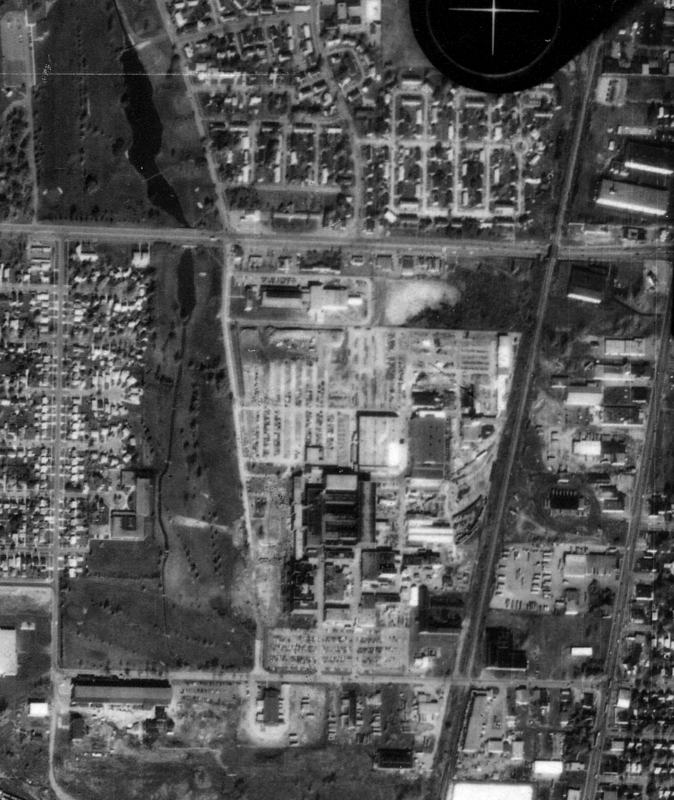 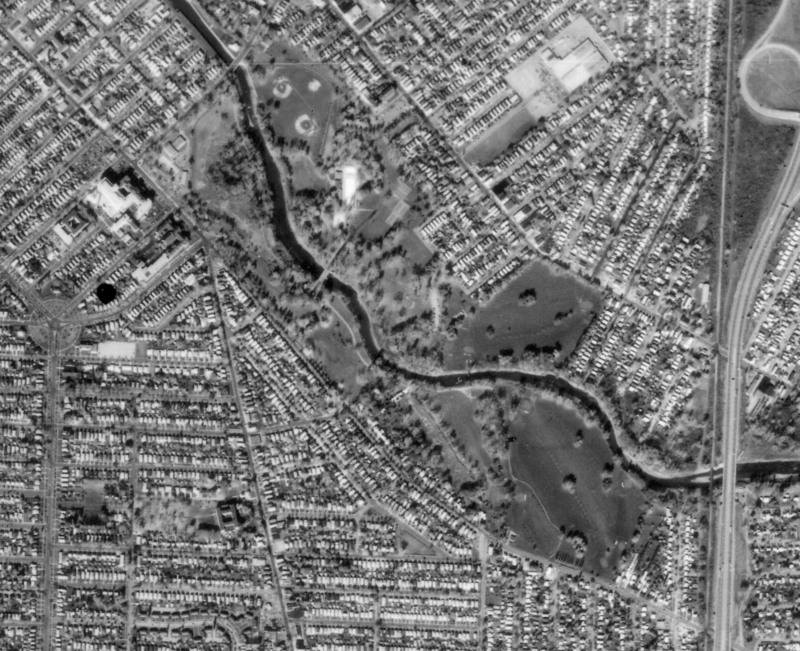 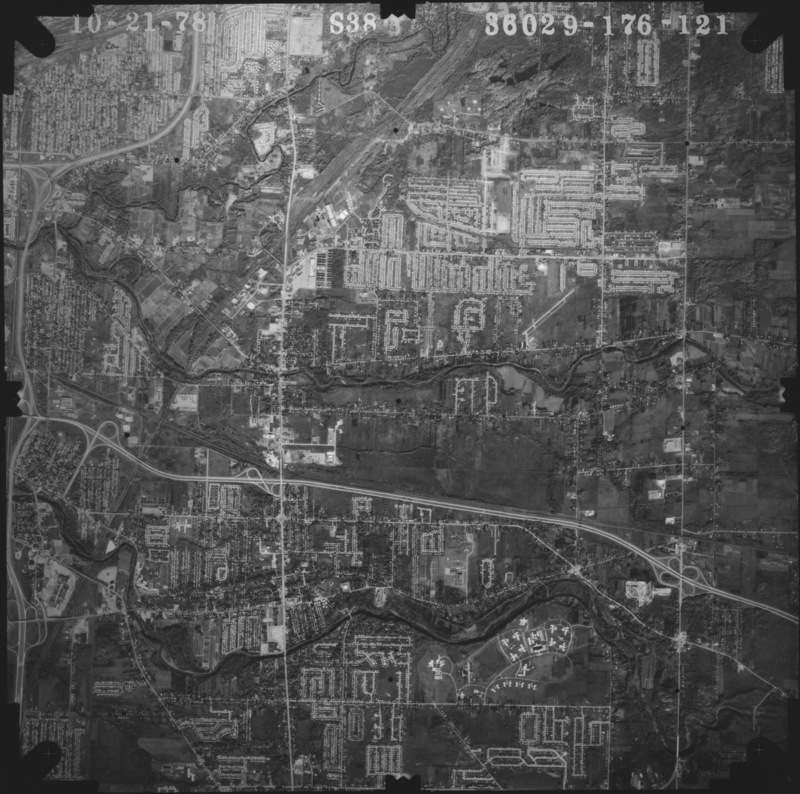 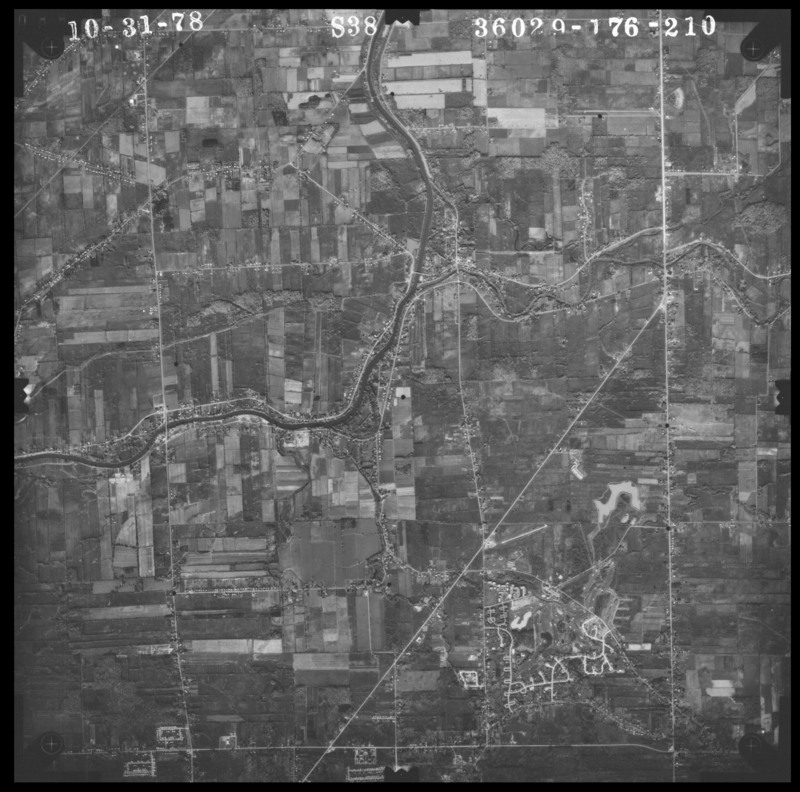 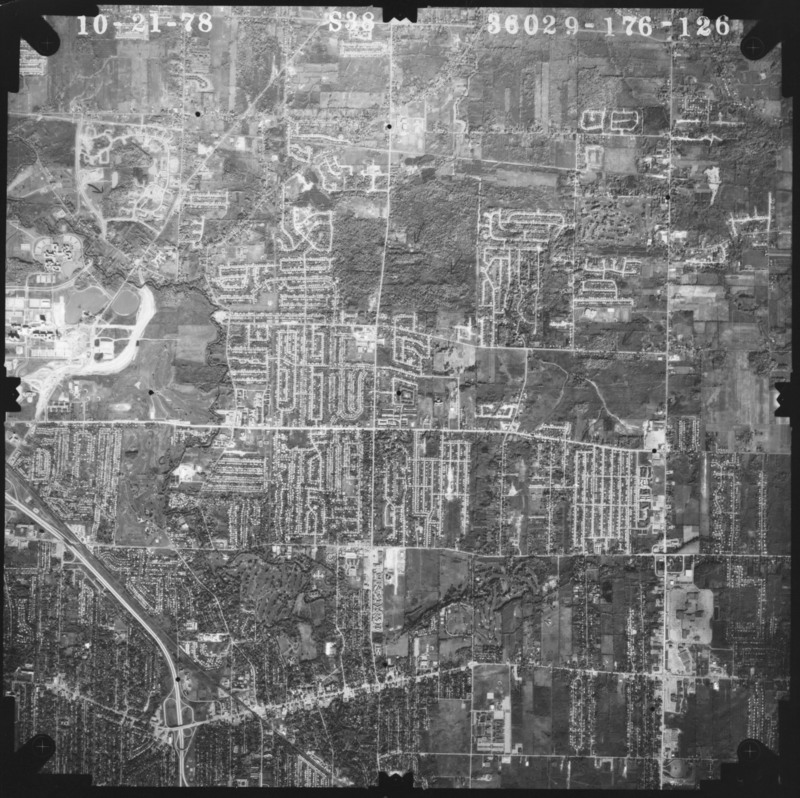 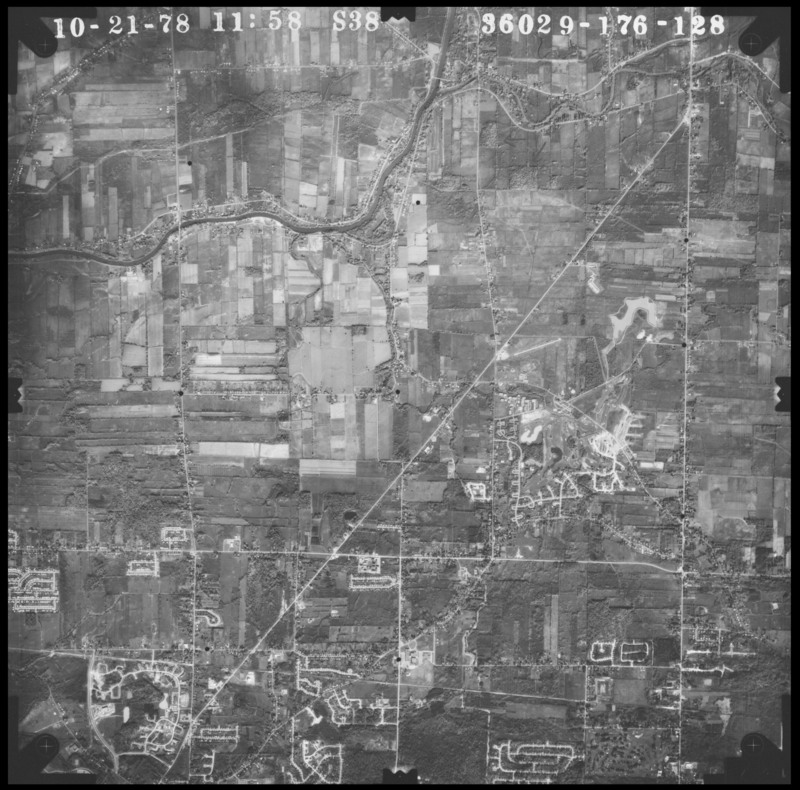 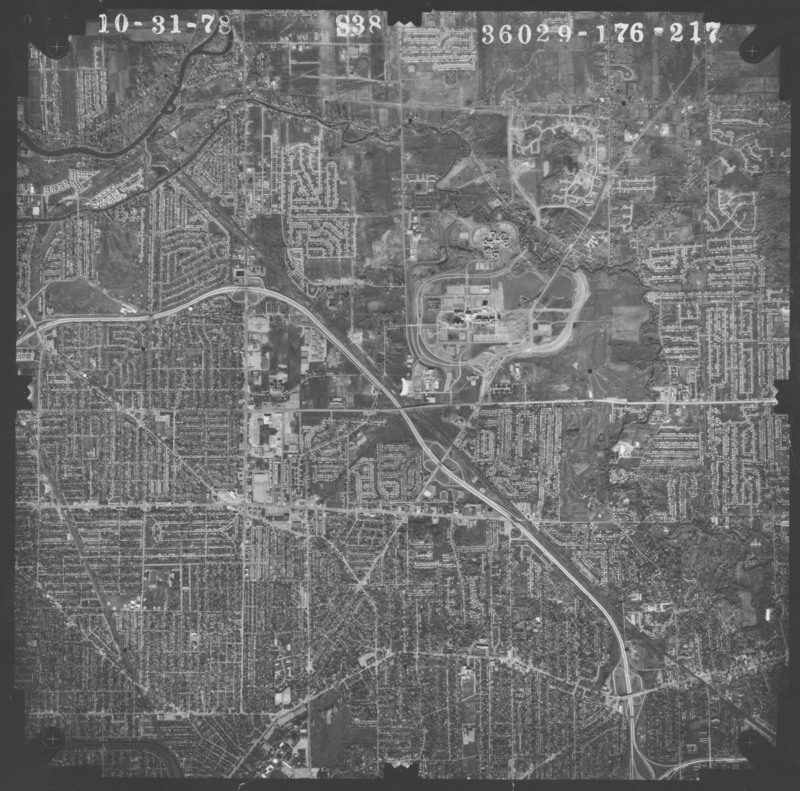 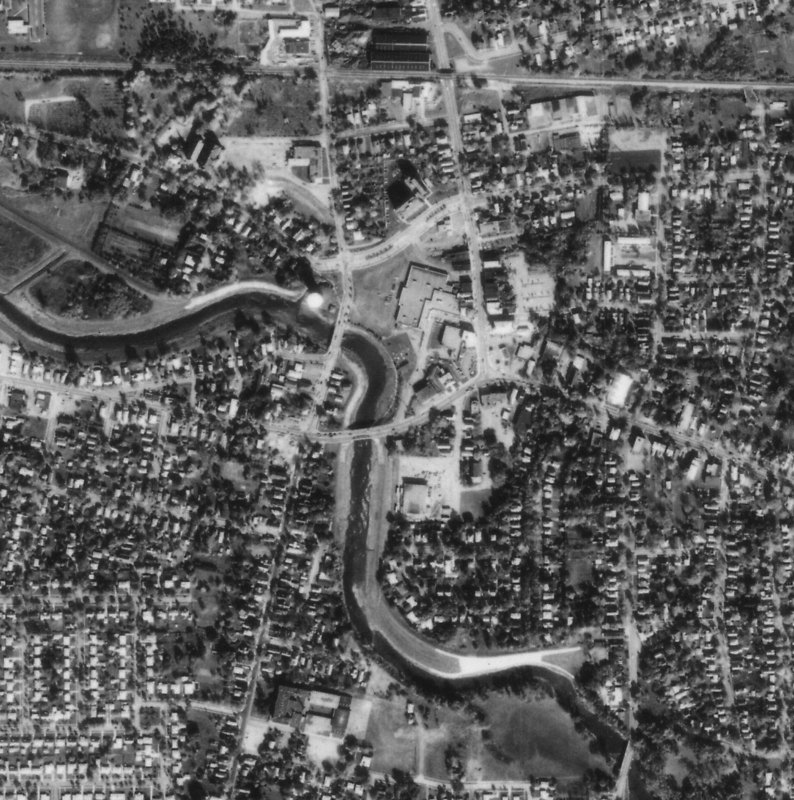 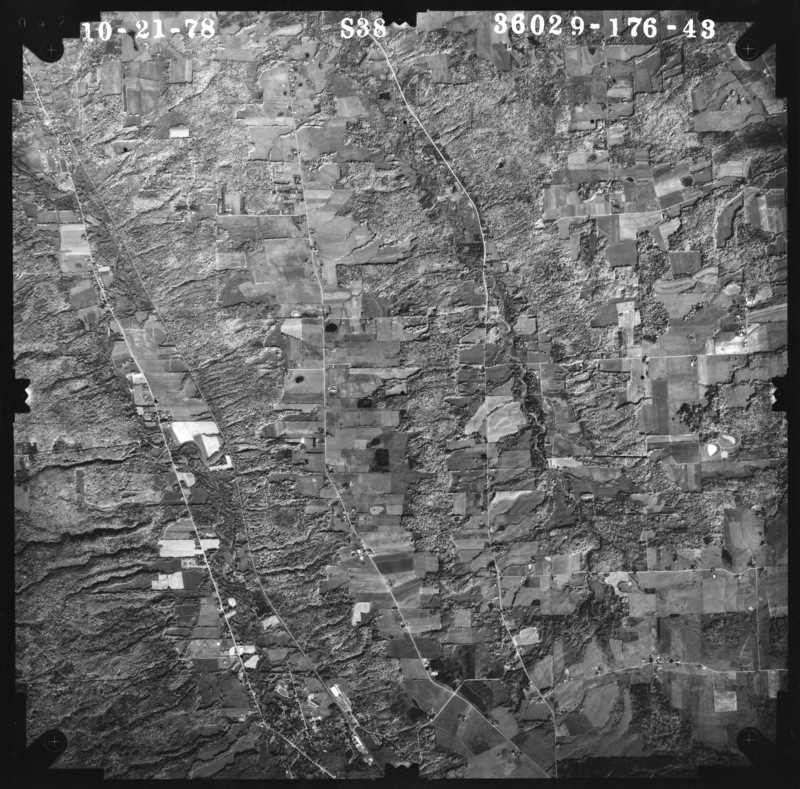 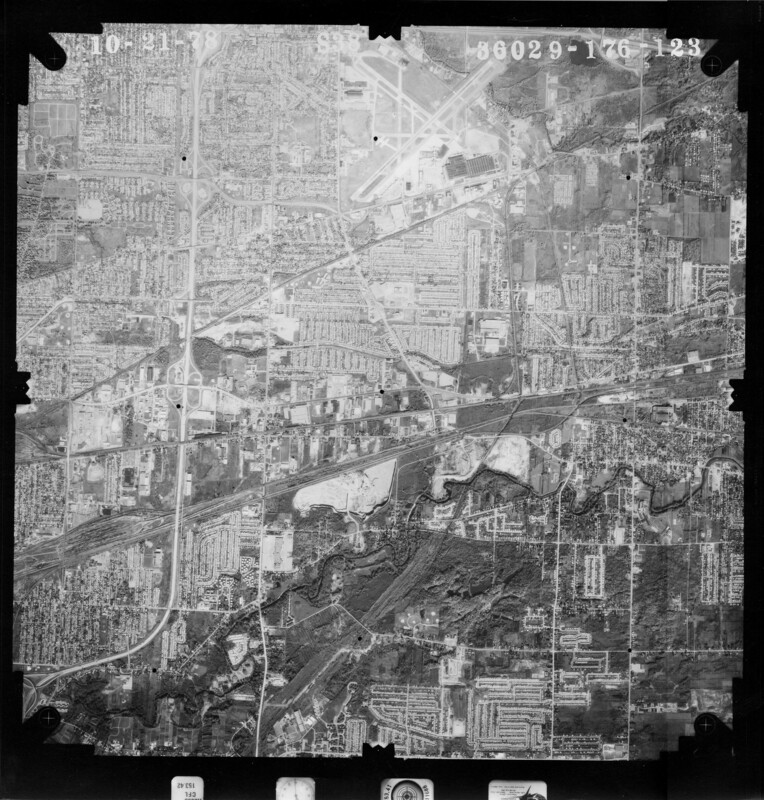 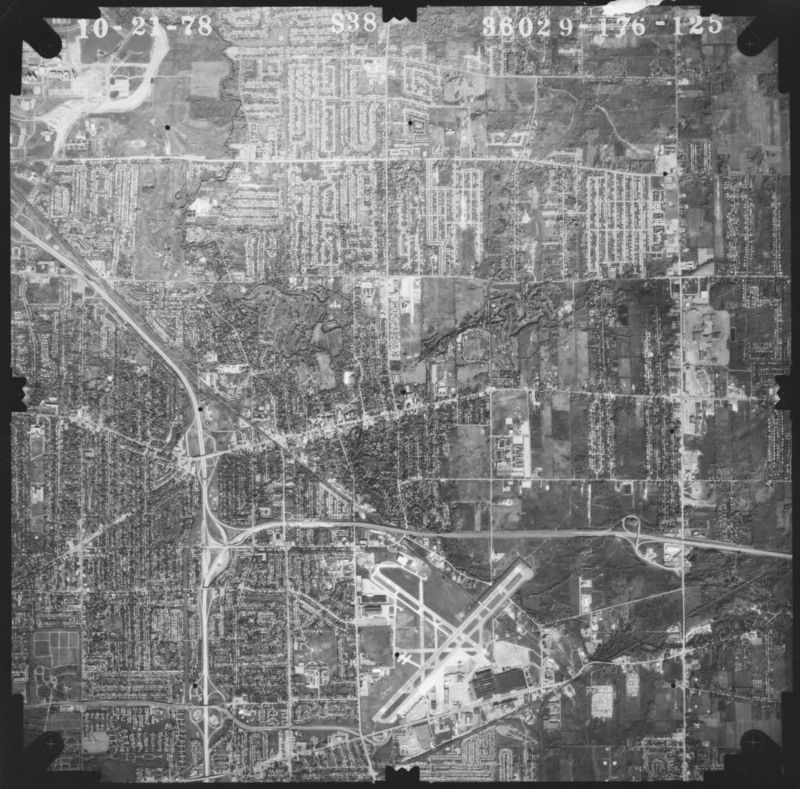 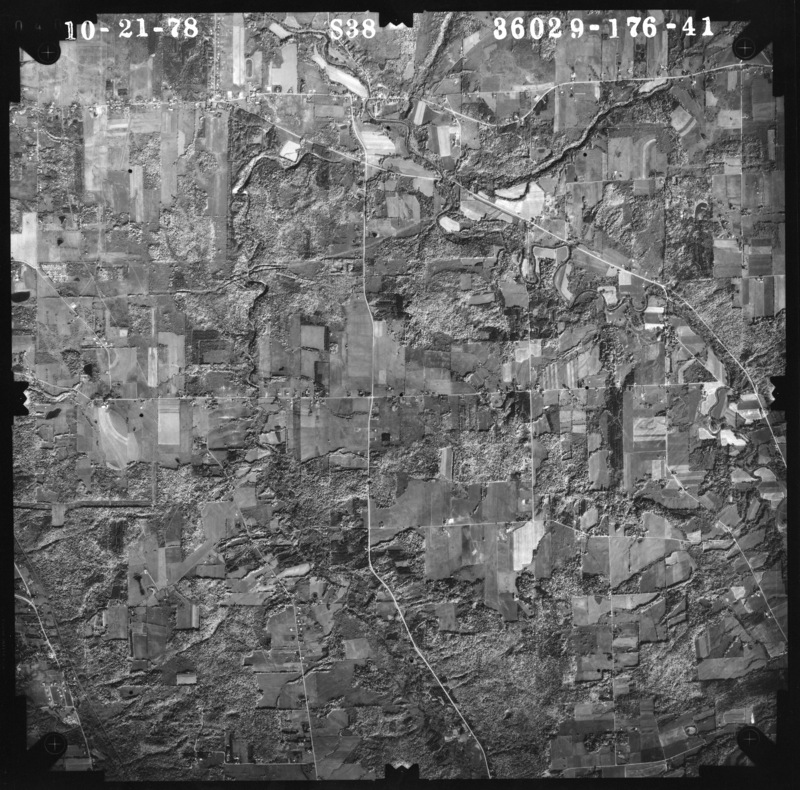 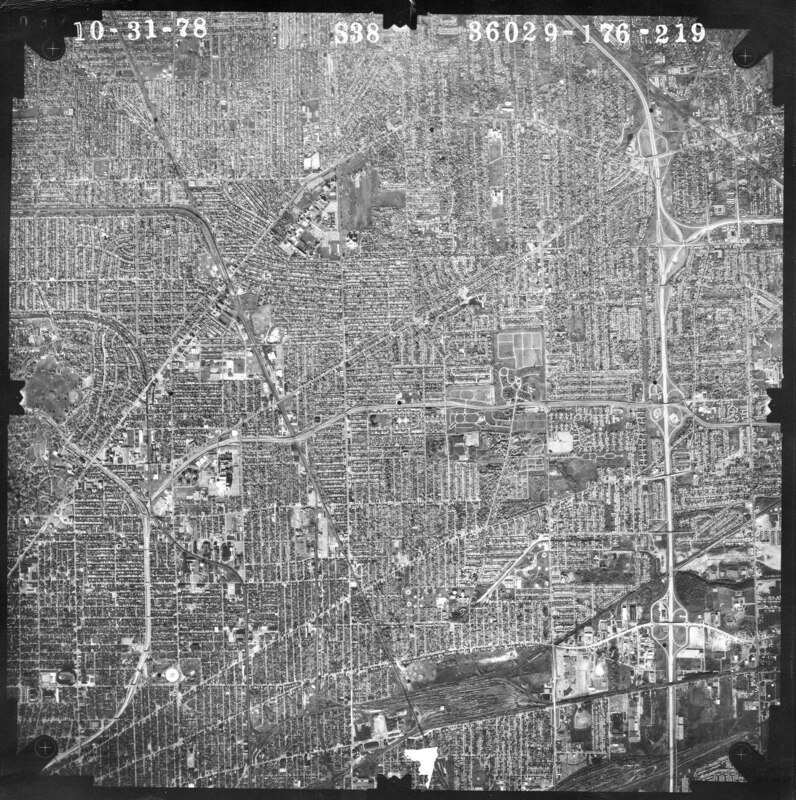 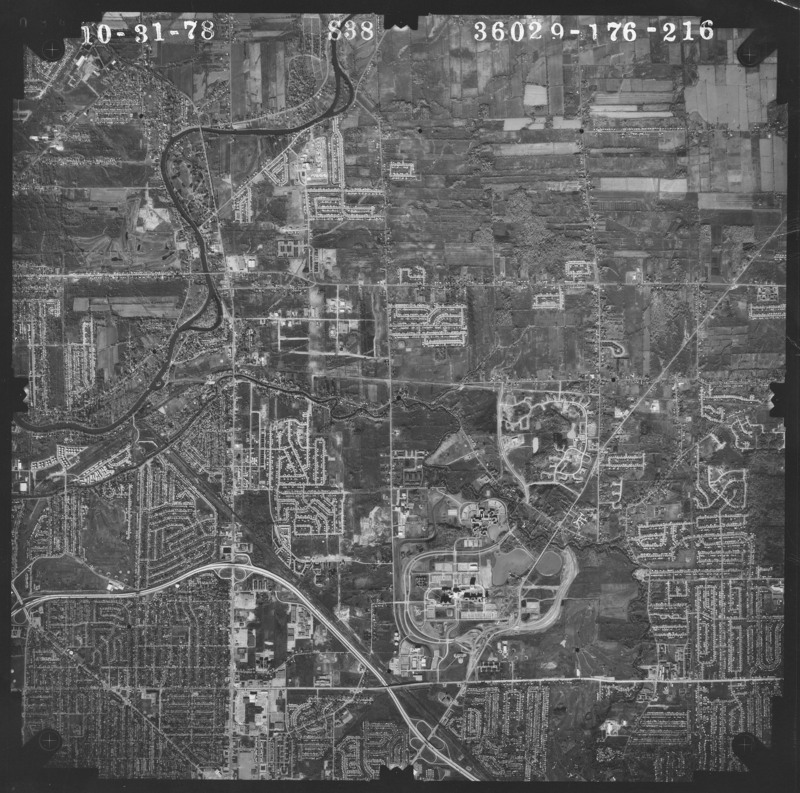 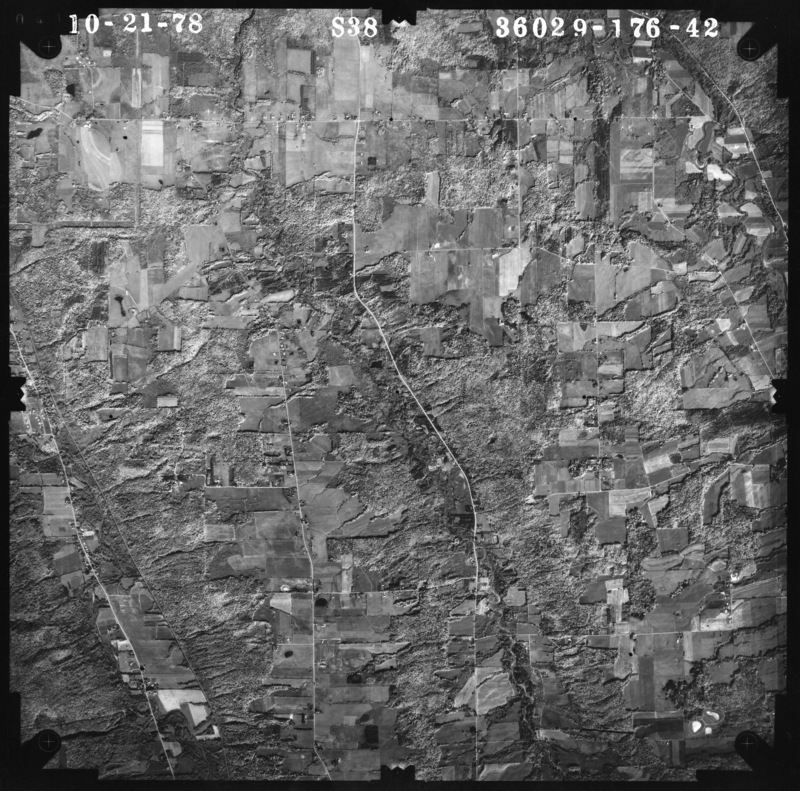 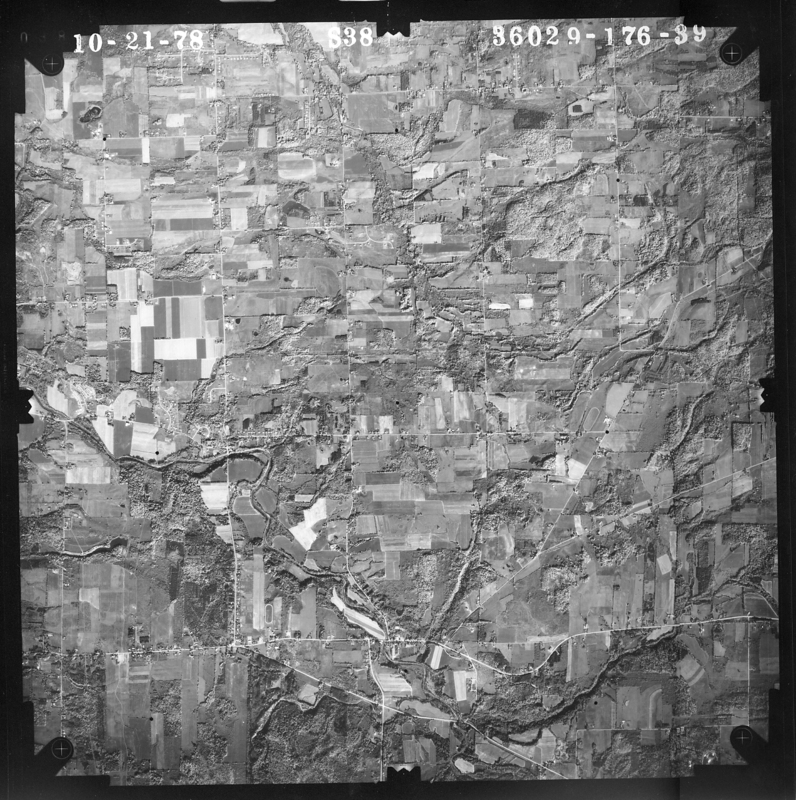 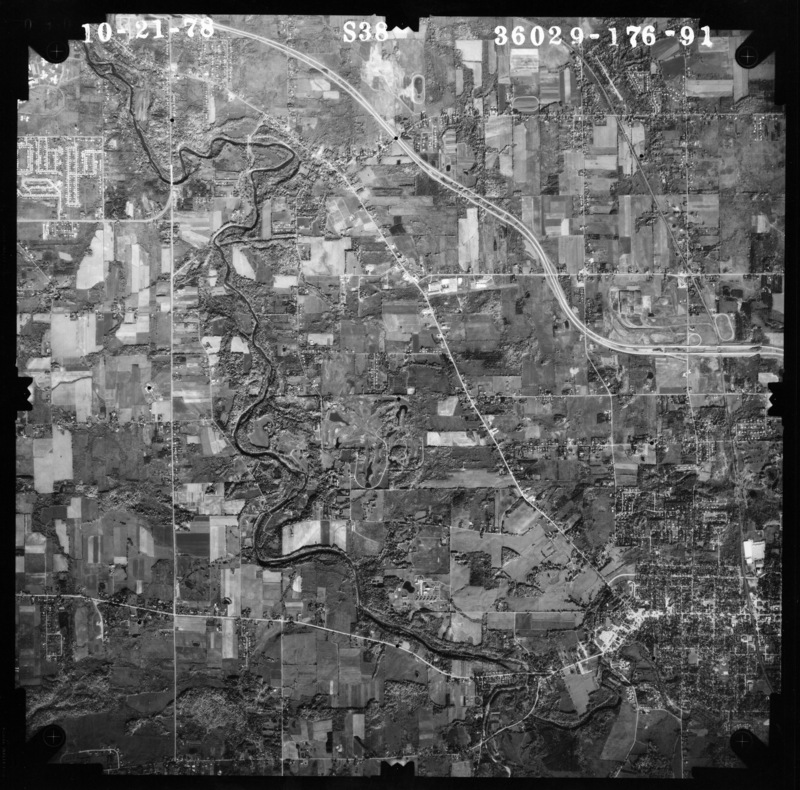 92, 93 Aurora & East Aurora (E); Orchard Park (W); West Falls (S); Colden (91 image). 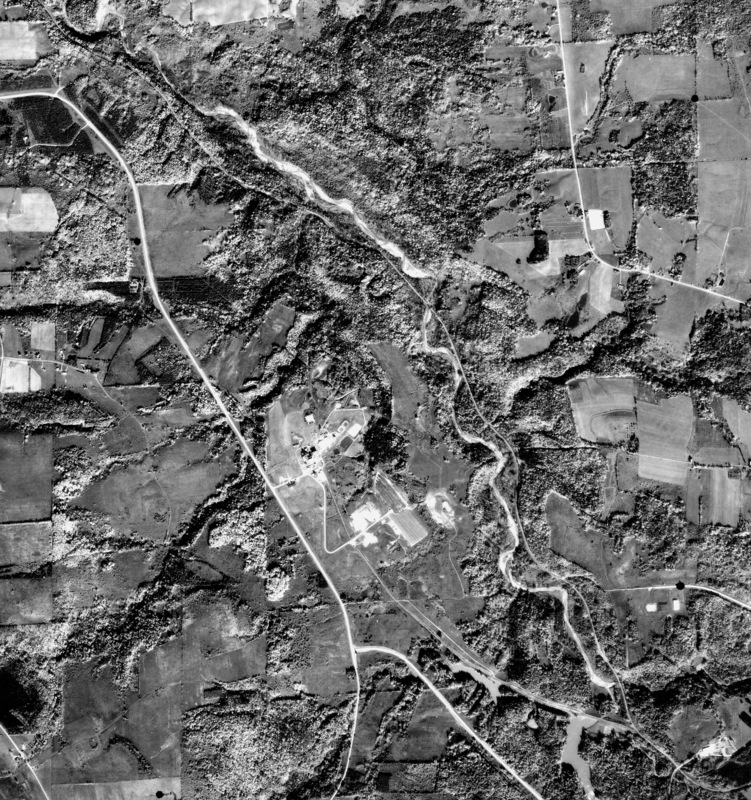 101 Ashford Hollow (near West Valley Nuclear Demonstration Project). 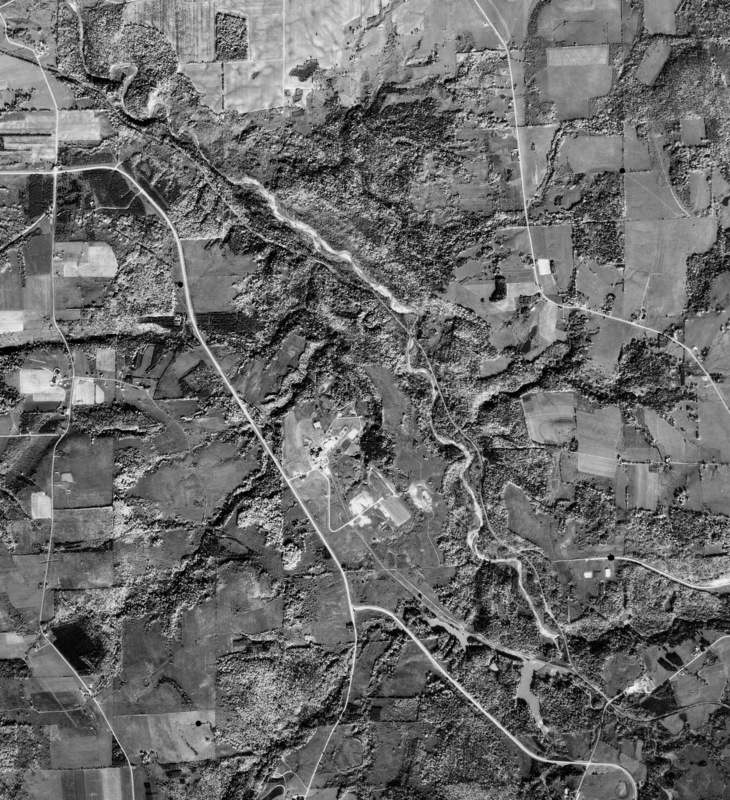 103 Western New York Nuclear Service Center (West Valley Nuclear Demonstration Project), Ashford, NY (Cattaraugus County). 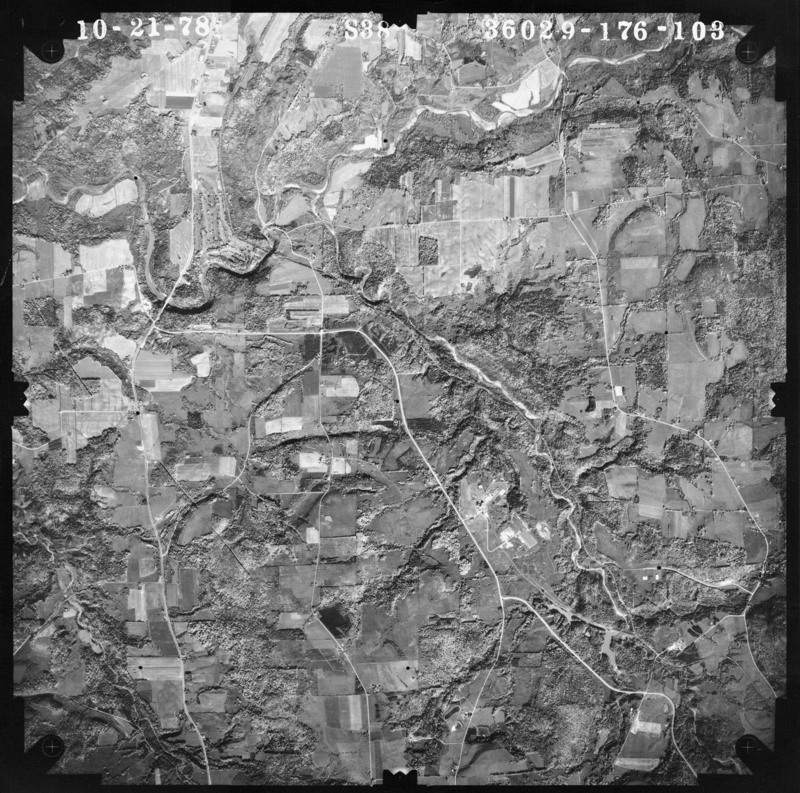 Includes Ashford and part of Cattaraugus Creek. 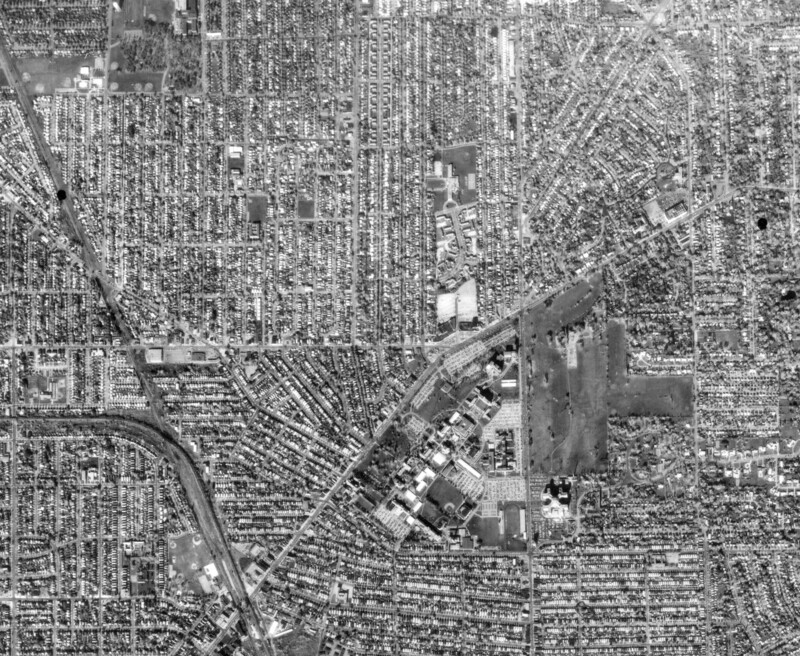 (Detail image of Center; 200% detail). 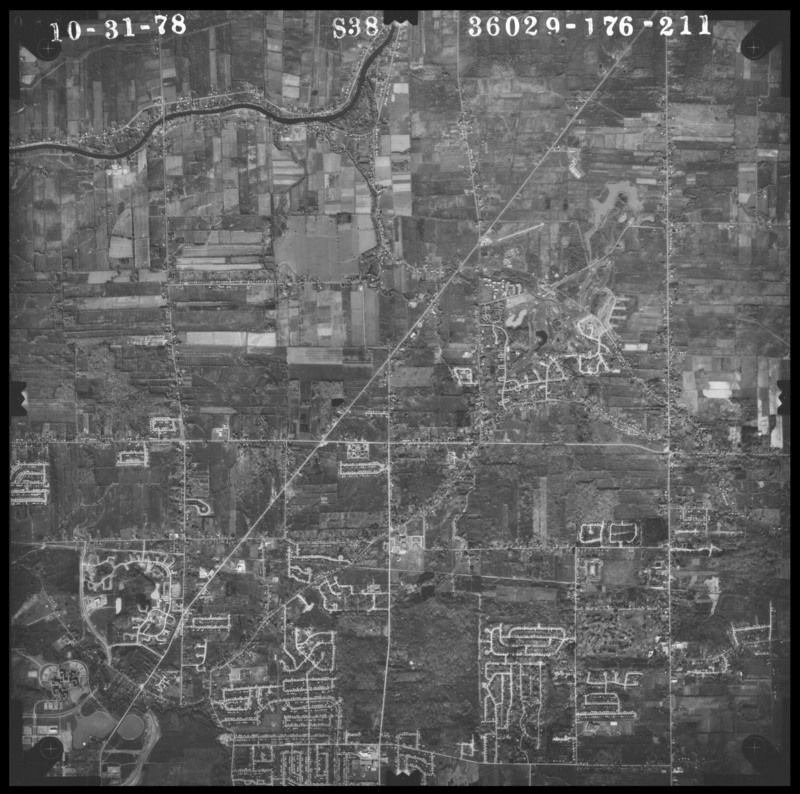 See also 1966 #114 for more images, map, and detail shots. 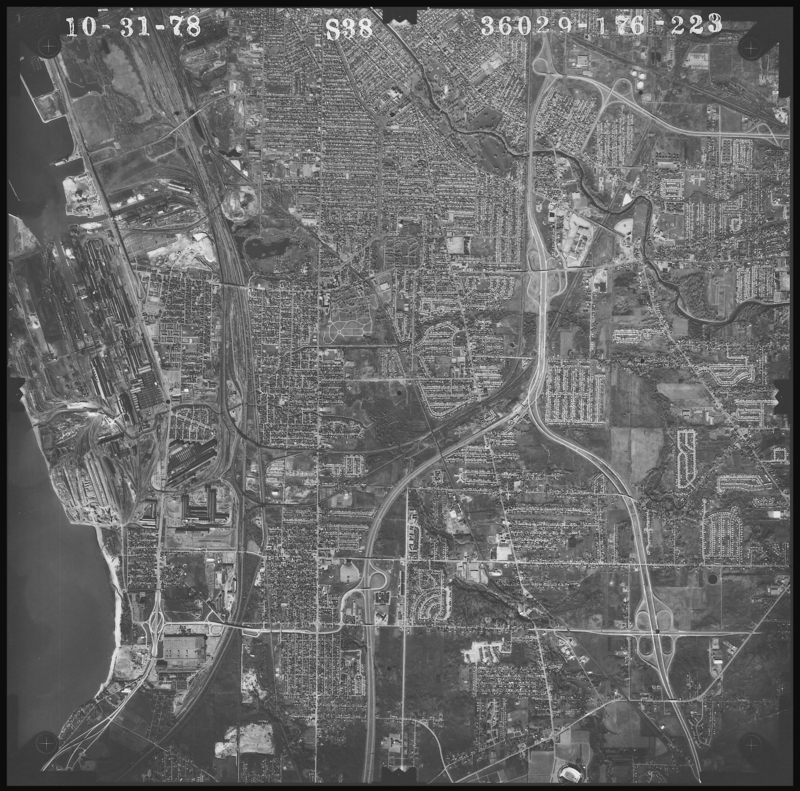 121 West Seneca; I-90/I190 junction (W), routh 400 (S), Transit (E) Clinton St. (N). 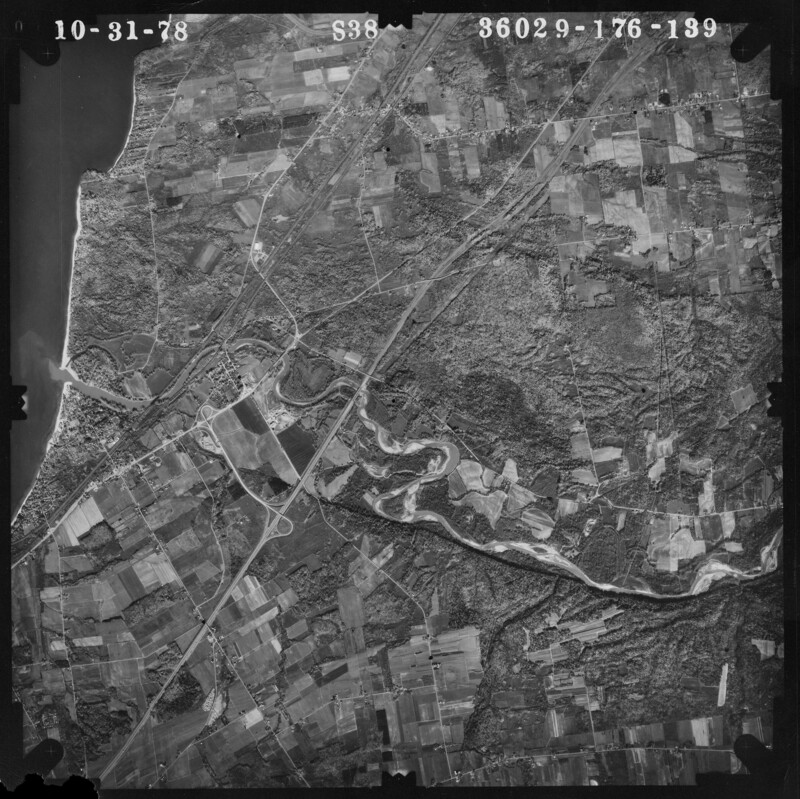 139 Cattaraugus Creek (County Line) W Lake shore-several miles inland. 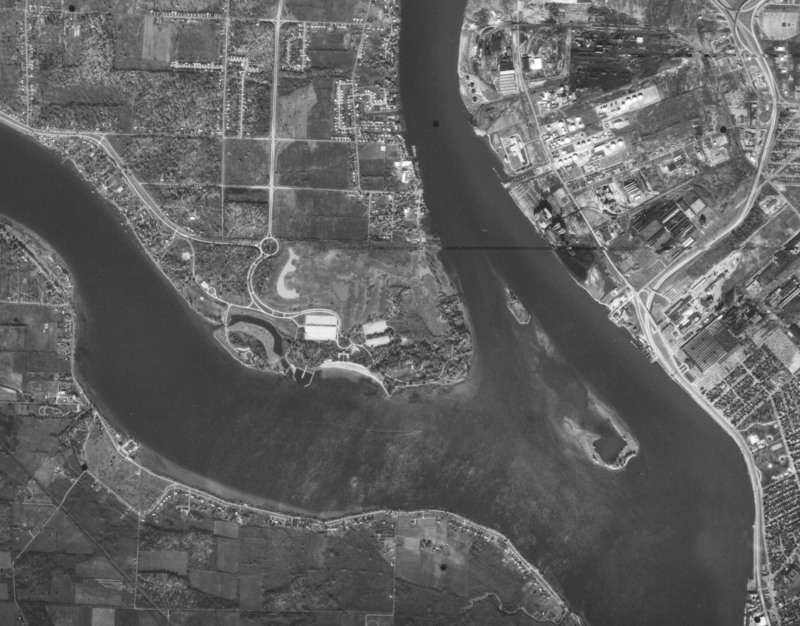 159, 160 Niagara Falls (N.Y.) along river (E to bridges and LaSalle Expwy), Grand Island W & NW, Navy Island, SE Niagara Falls, Ont. 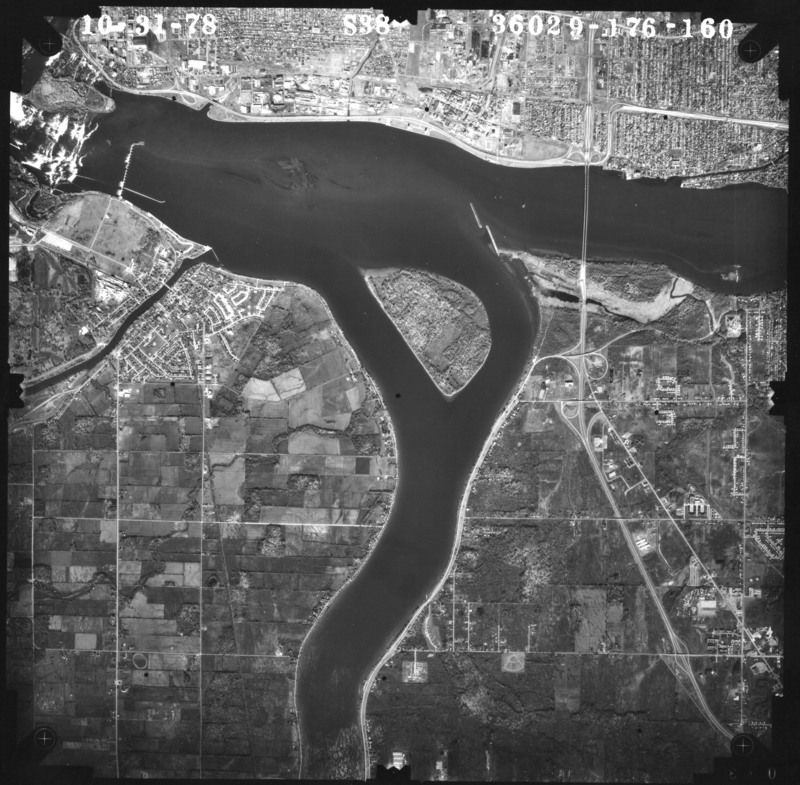 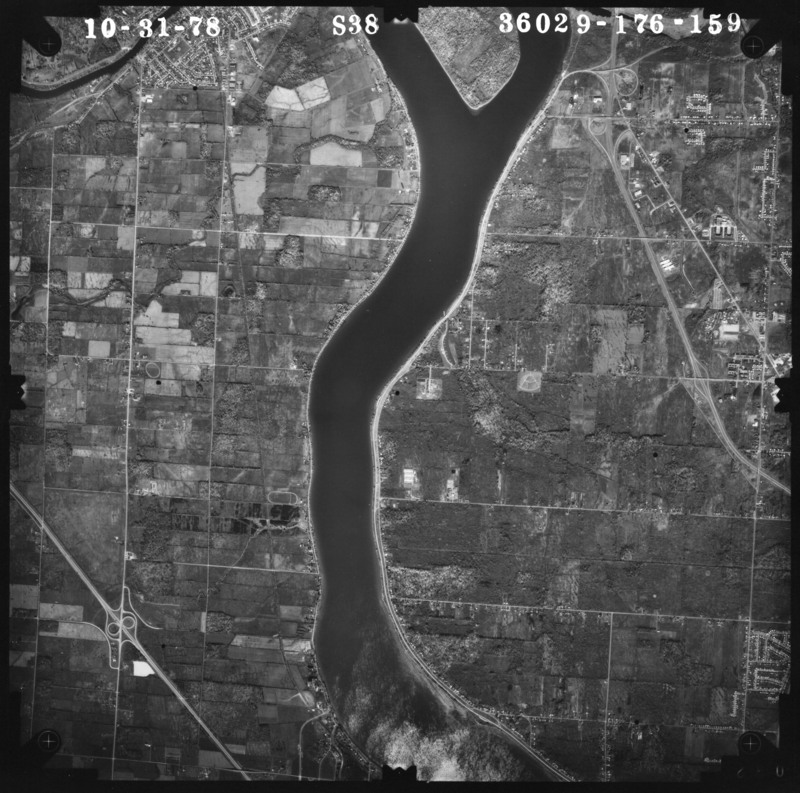 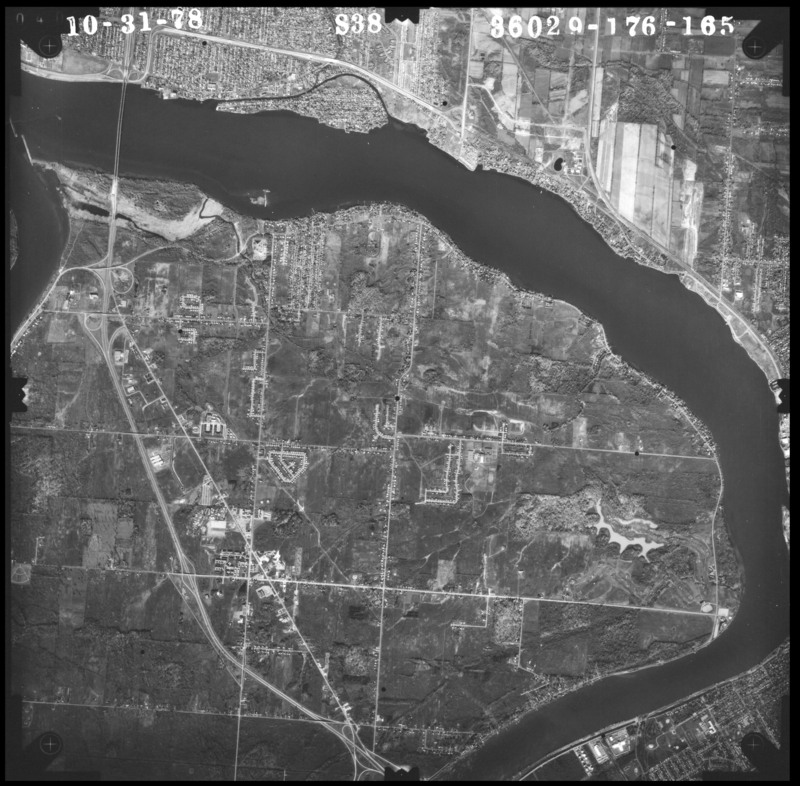 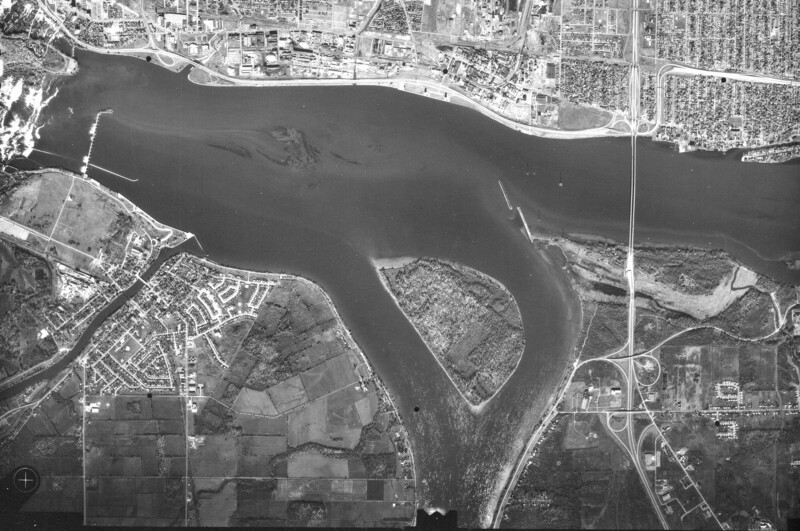 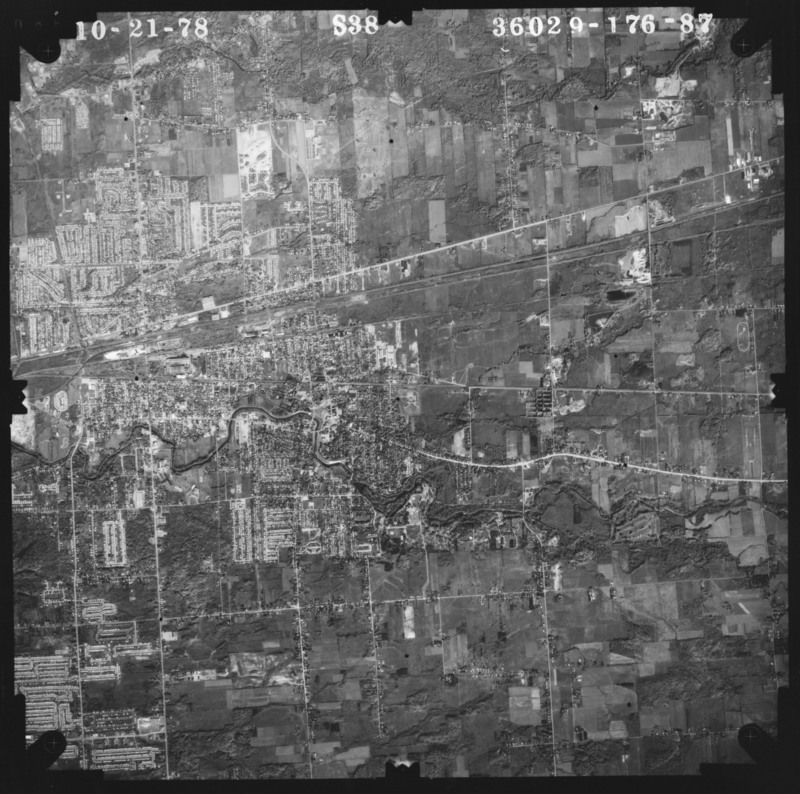 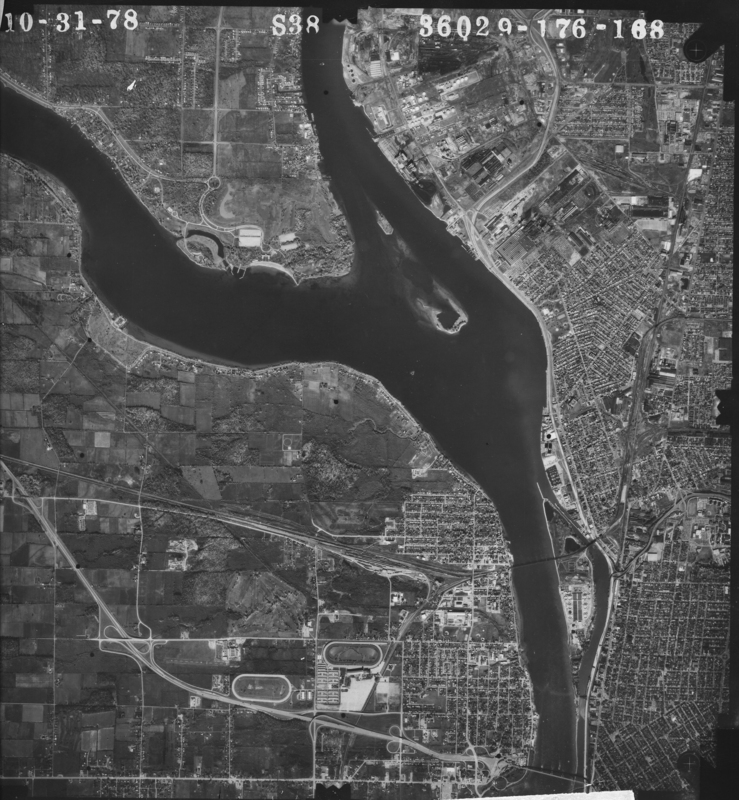 (Township), showing Chippewa; S border (159) on Fort Erie). 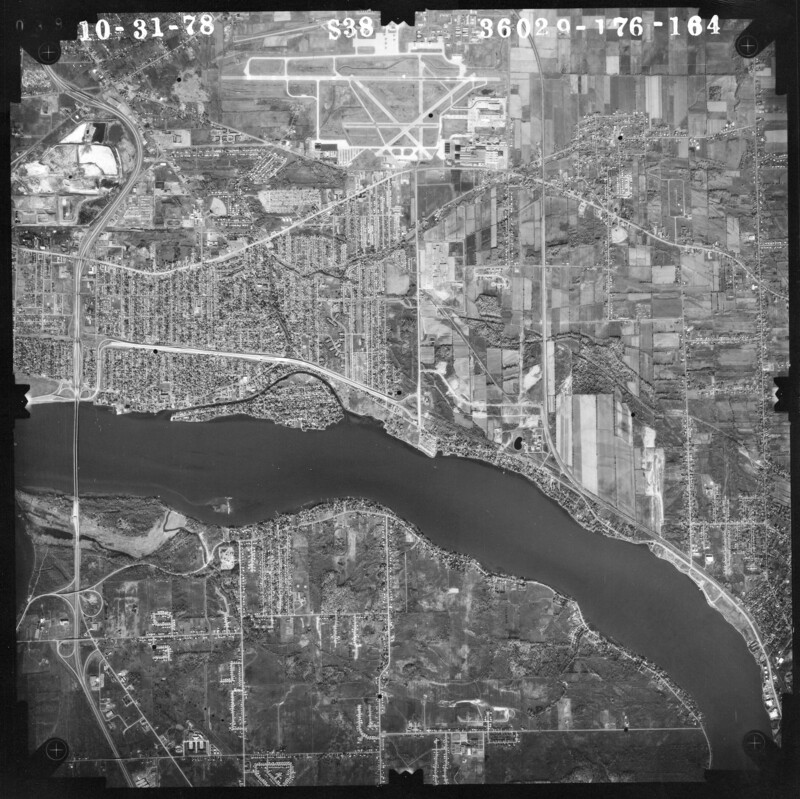 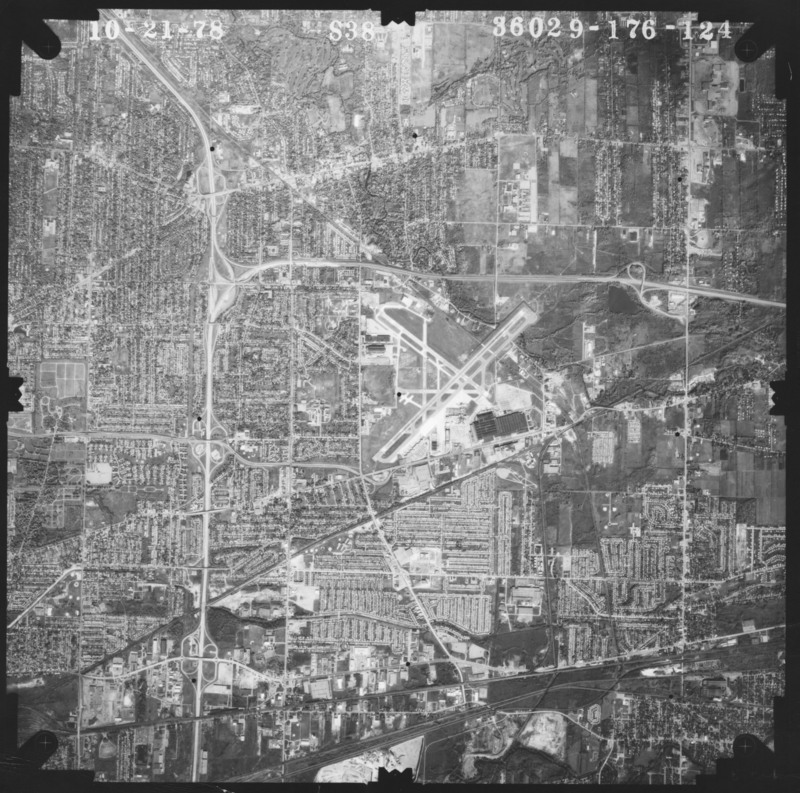 167 Tonawanda west (Sheridan Drive & Military); Grand Island (south); Includes Beaver Island State Park; excerpt of Park. 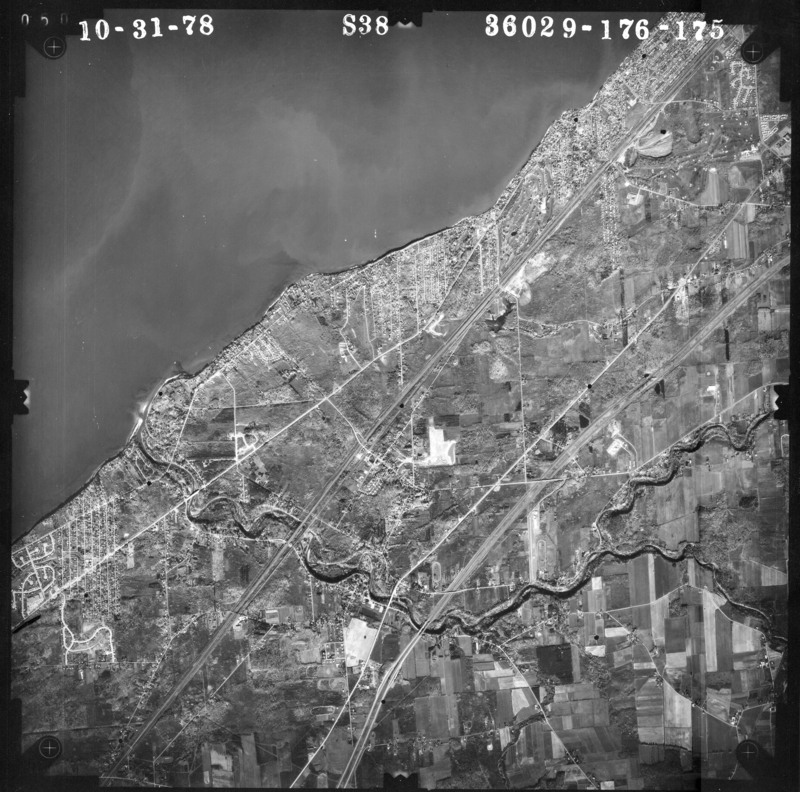 168 Tonawanda west (Sheridan Drive & Military) section (at 300%) excerpt showing Black Rock/Niagara River section. 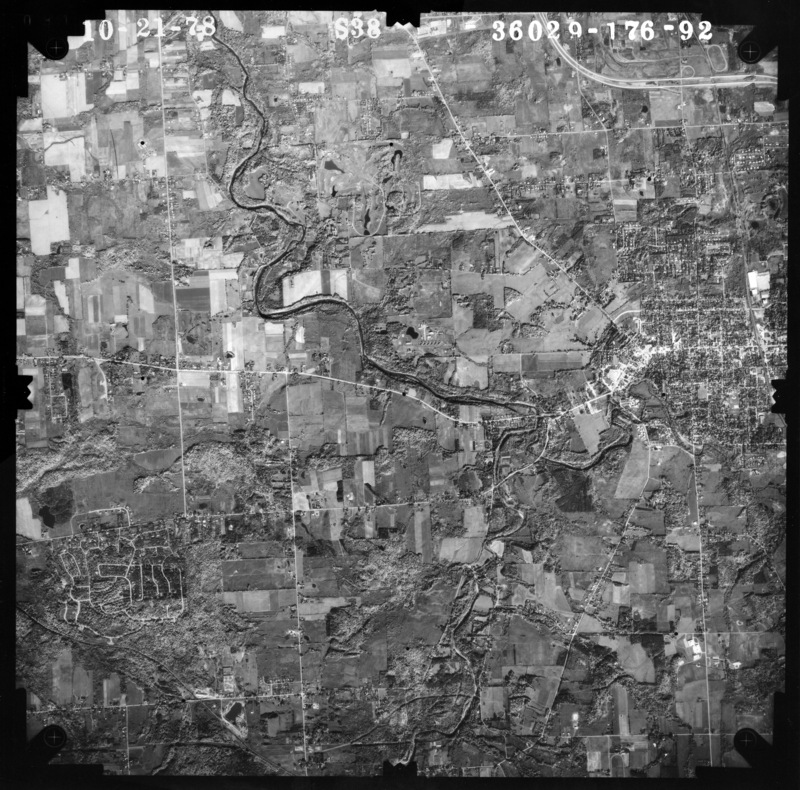 175 Derby, SE Hamburg, Eighteen Mile Creek from W of Eden to Lake Erie; 300% excerpt near Creek mouth. 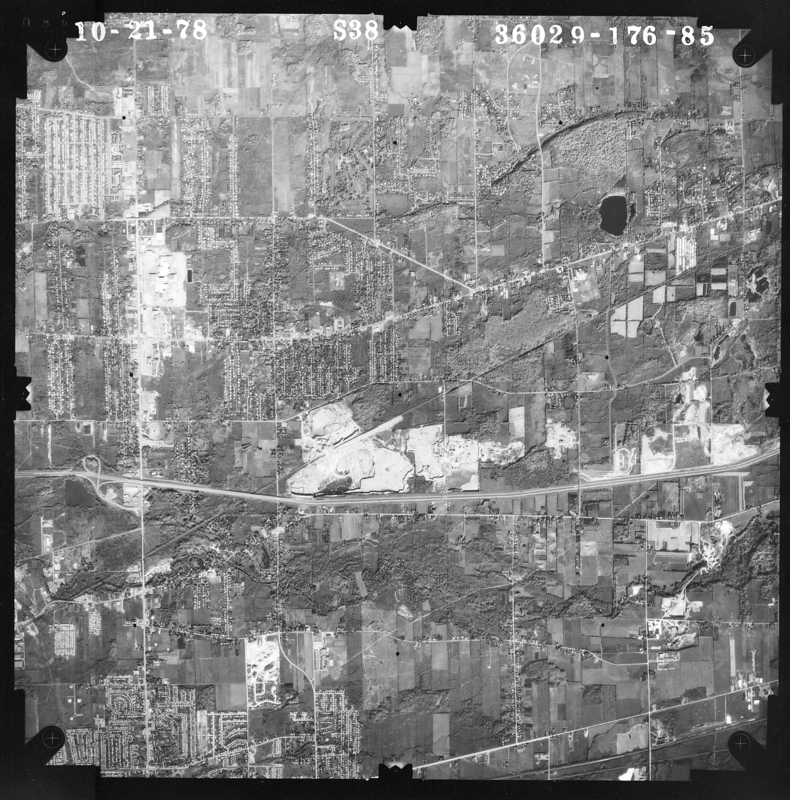 198 (W) Lake Erie; (N) Ridge Rd (Smoke Creek); (E) S. Park Ave; (S) Wanakah Ctry Club, Camp Rd, Pleasant. 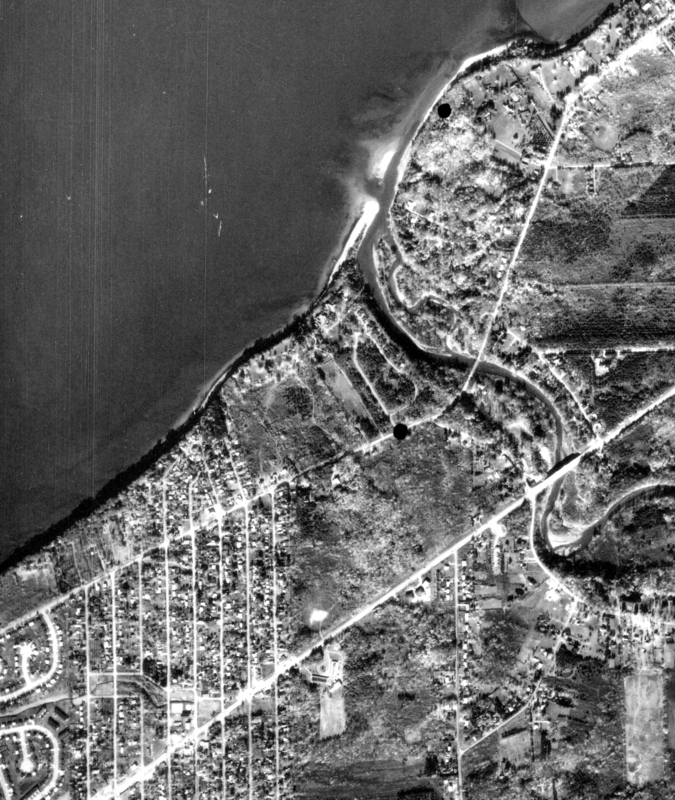 Also Hamburg Town Park. 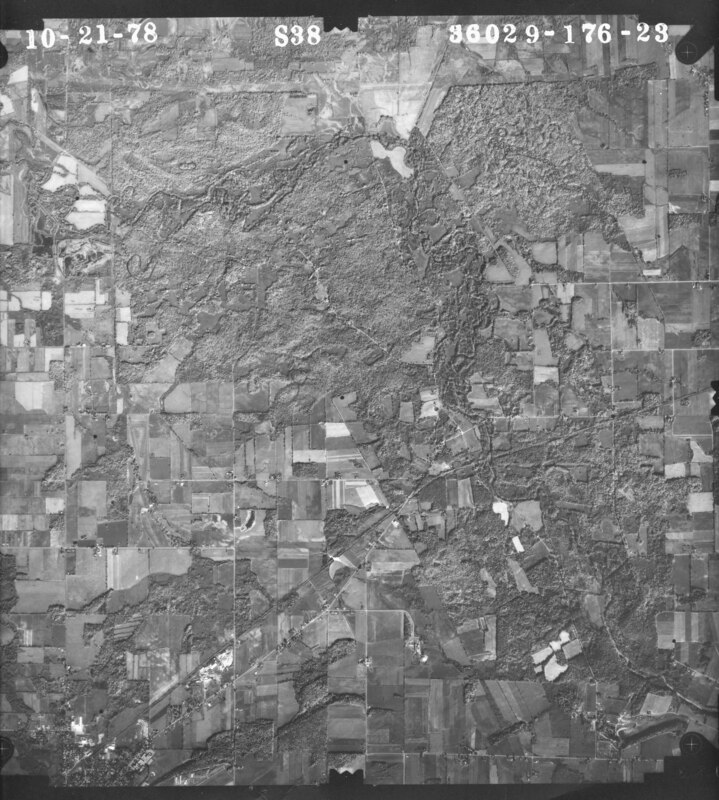 200 Buffalo River, South Buffalo Area. 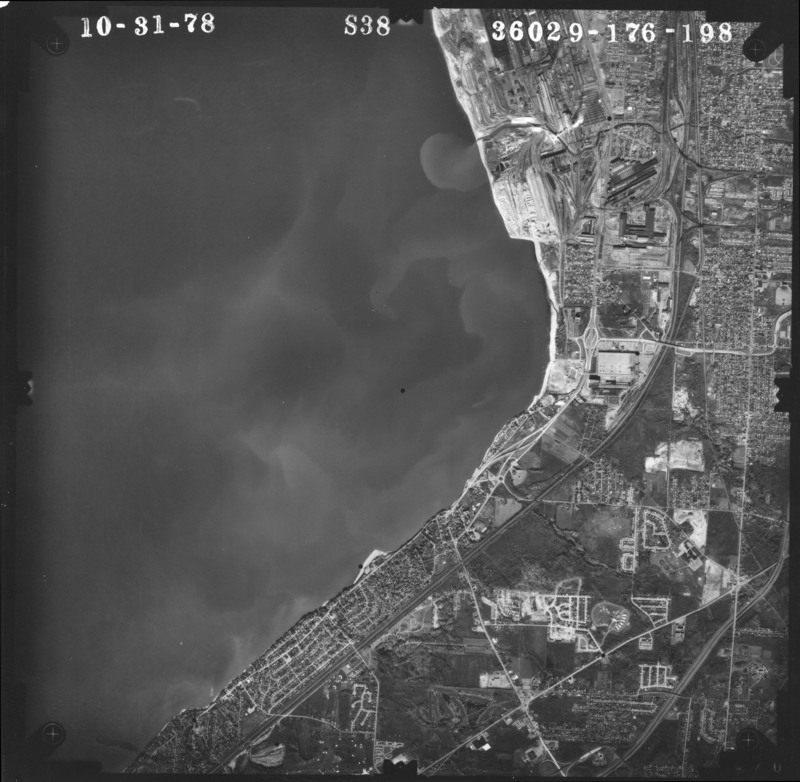 (W) Lake Erie; (N) Small Boat Harbor, William St; (E) South Park Ave; (S) Ridge Rd (Smoke Creek). 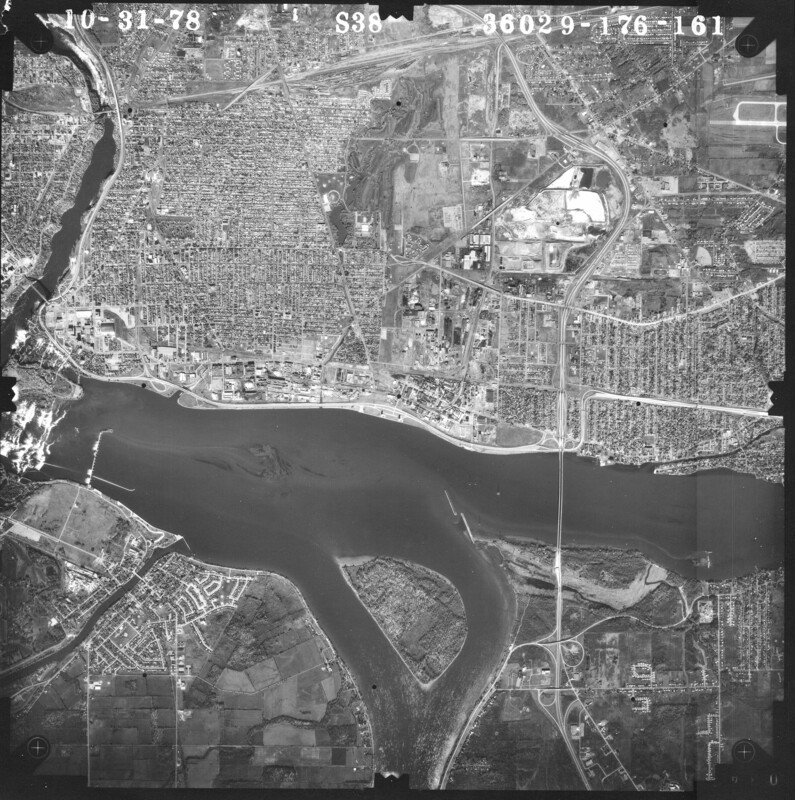 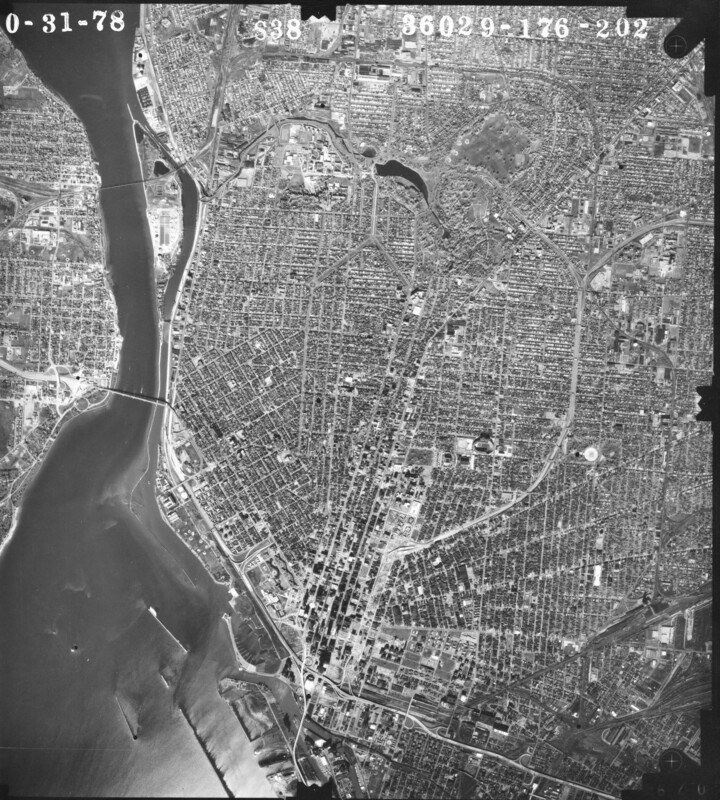 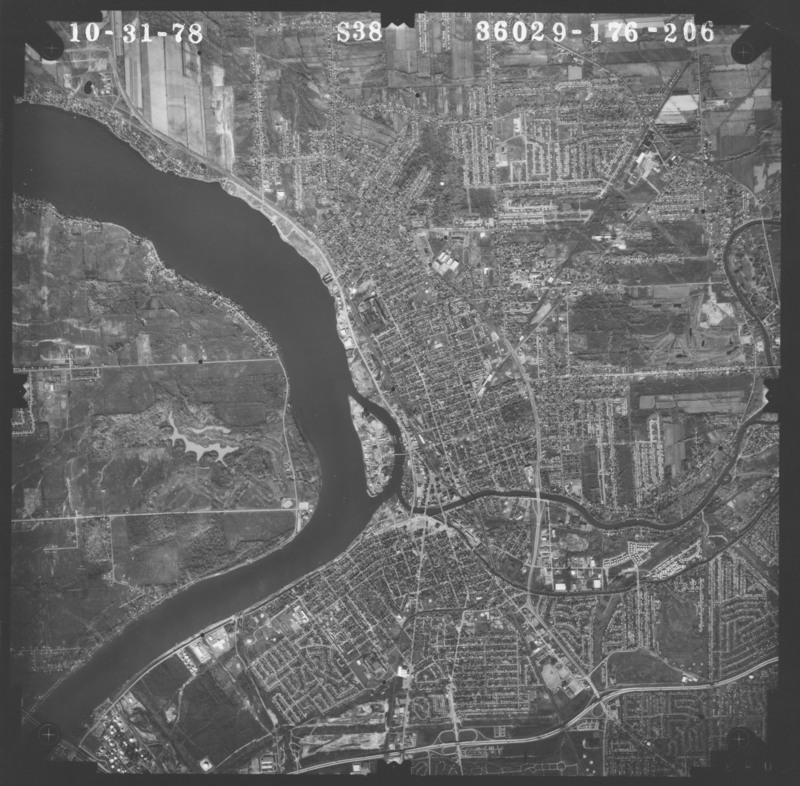 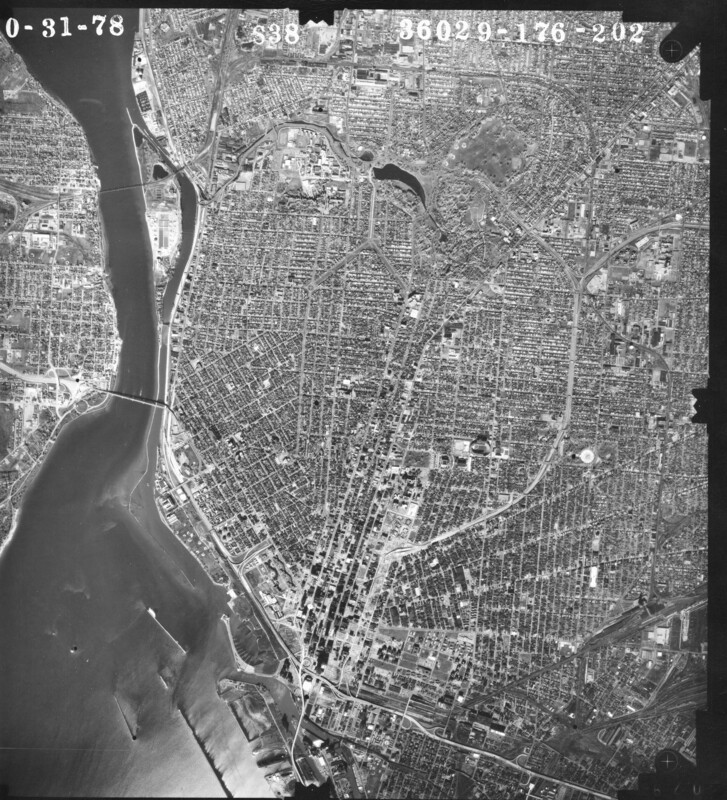 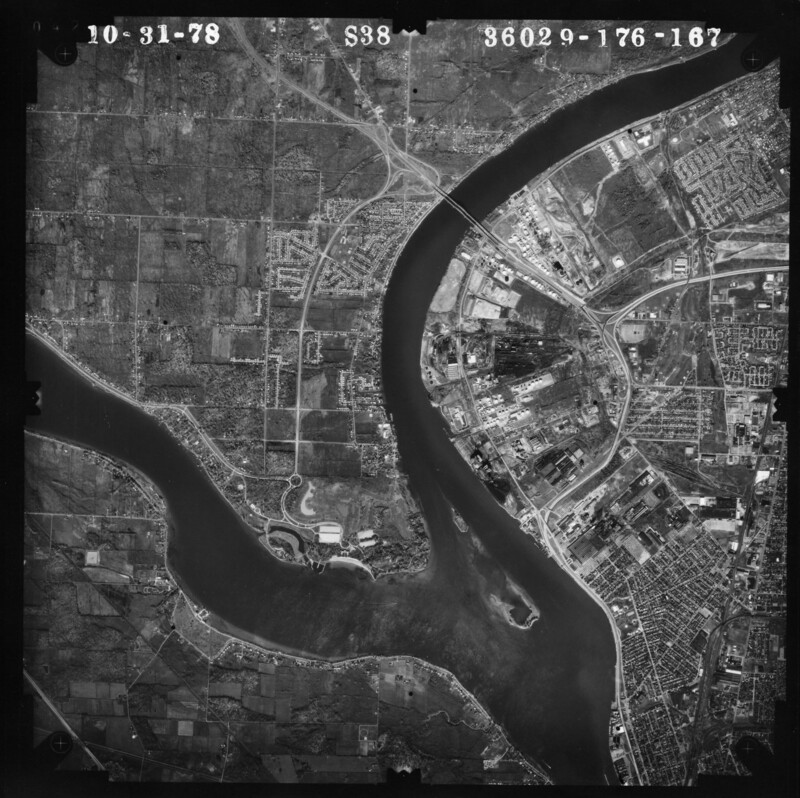 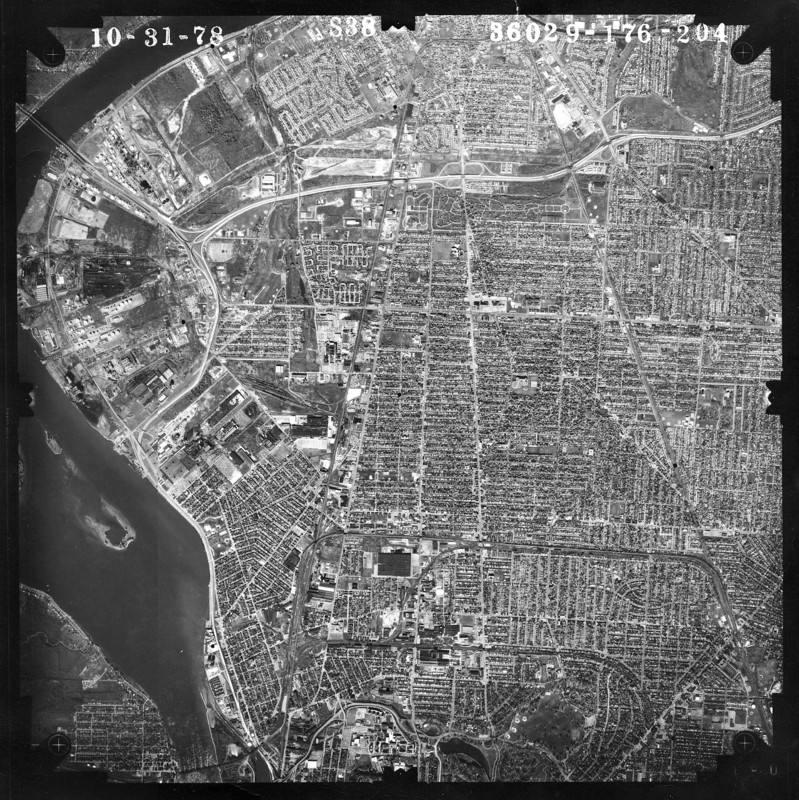 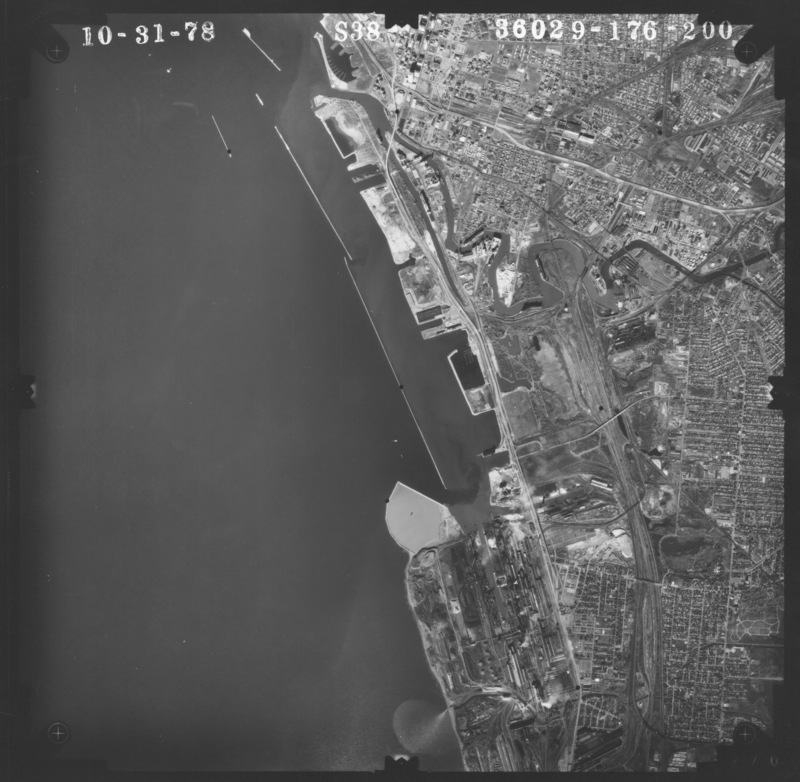 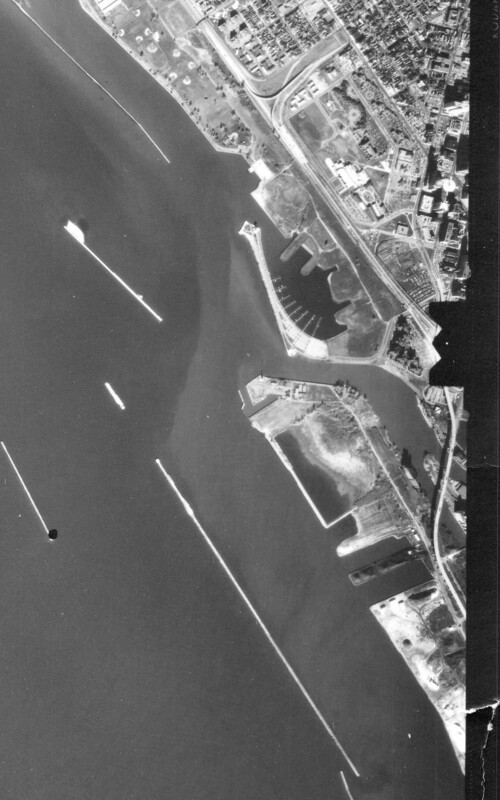 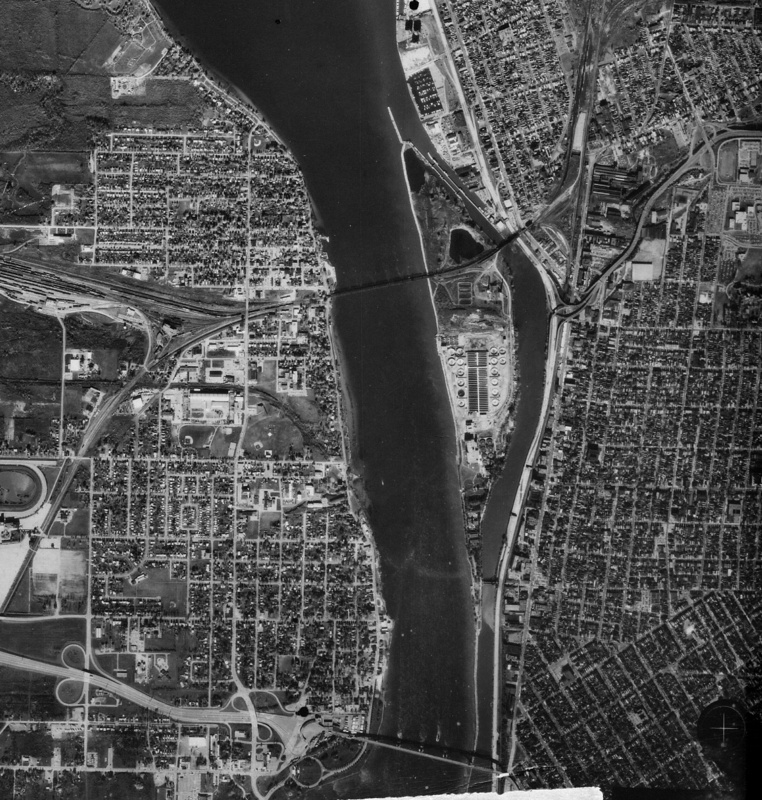 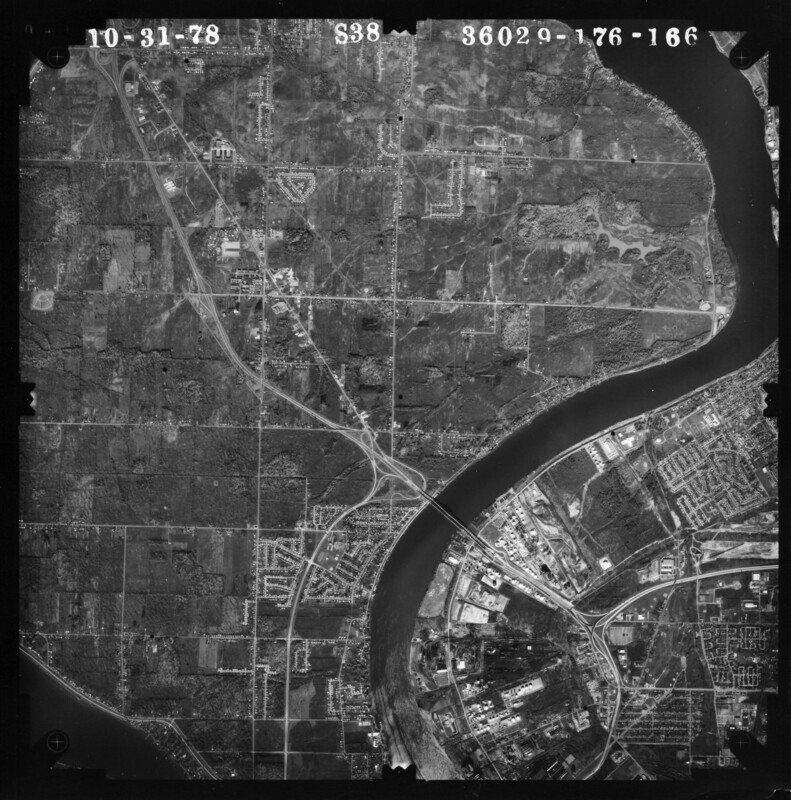 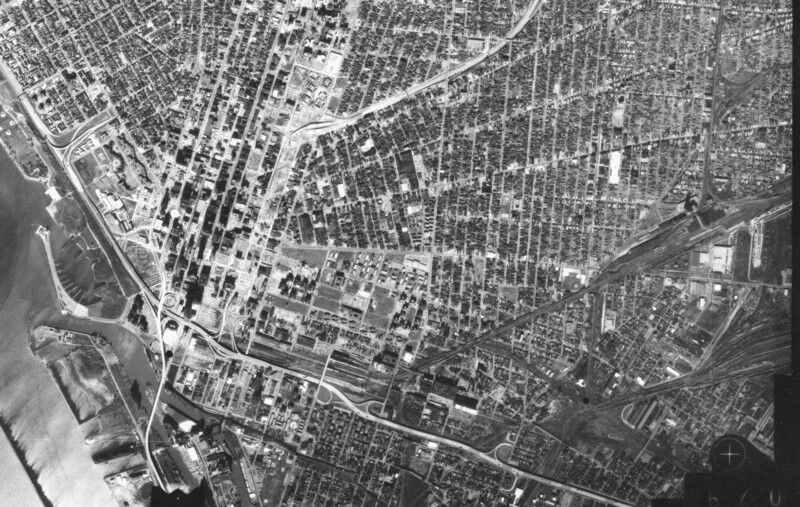 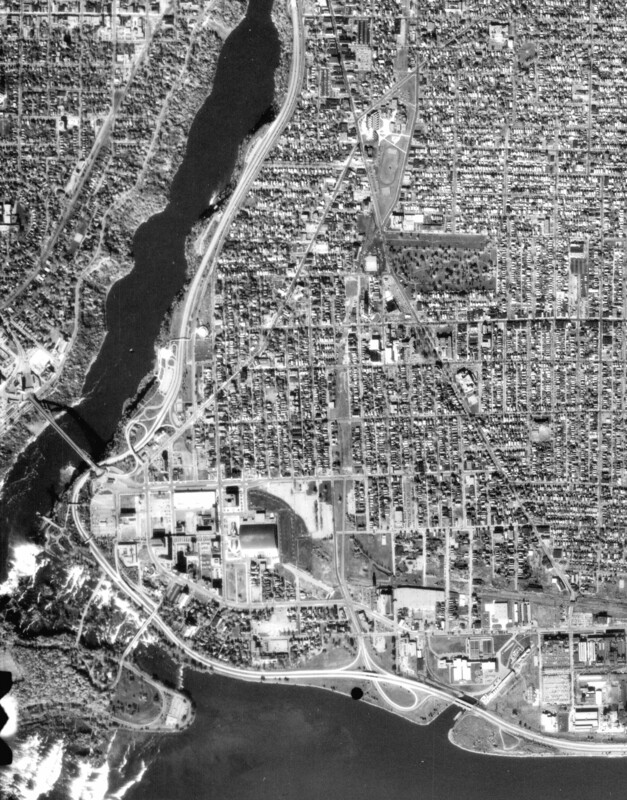 204 Town of Tonawanda (Grand Island Bridges, I-290, I-190, to North Buffalo (Scajacquada Expressway), to International RR Bridge (to Canada), to Eggert Road). 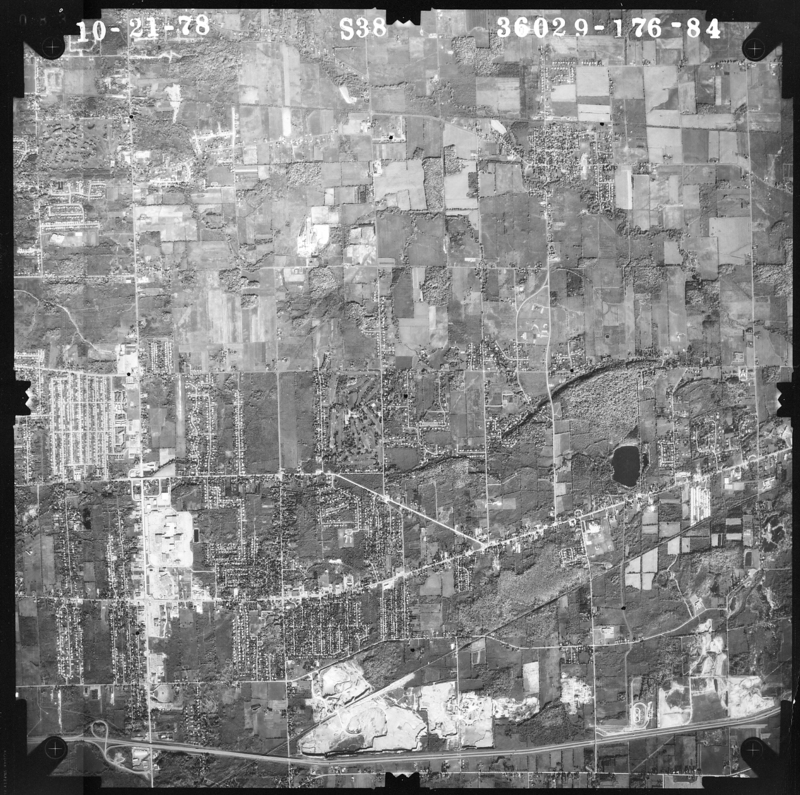 210, 211 Amherst-Pendleton area along Tonawanda Creek (Transit Road & Millersport--New Road--Tonawanda Creek Road) See also 128 adjoining image. 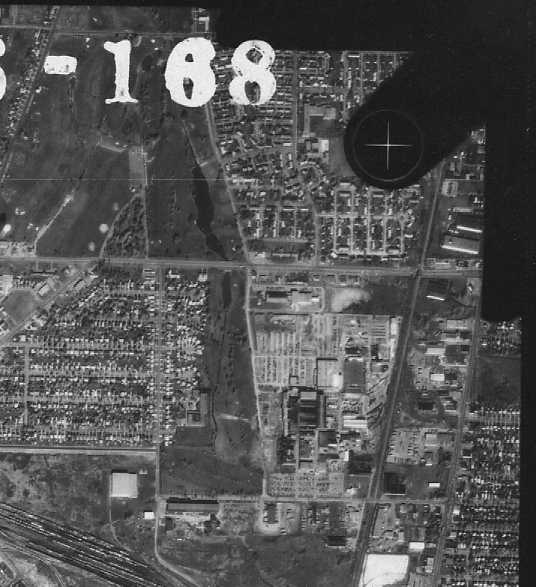 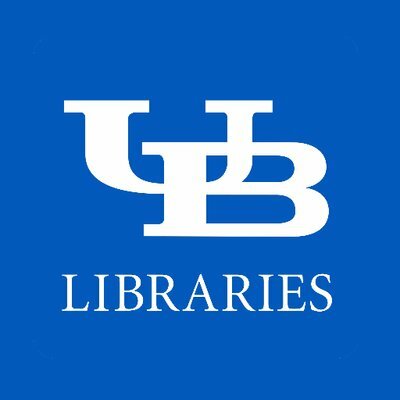 216 UB North Campus and Getzville/North Forest; Tonawanda. 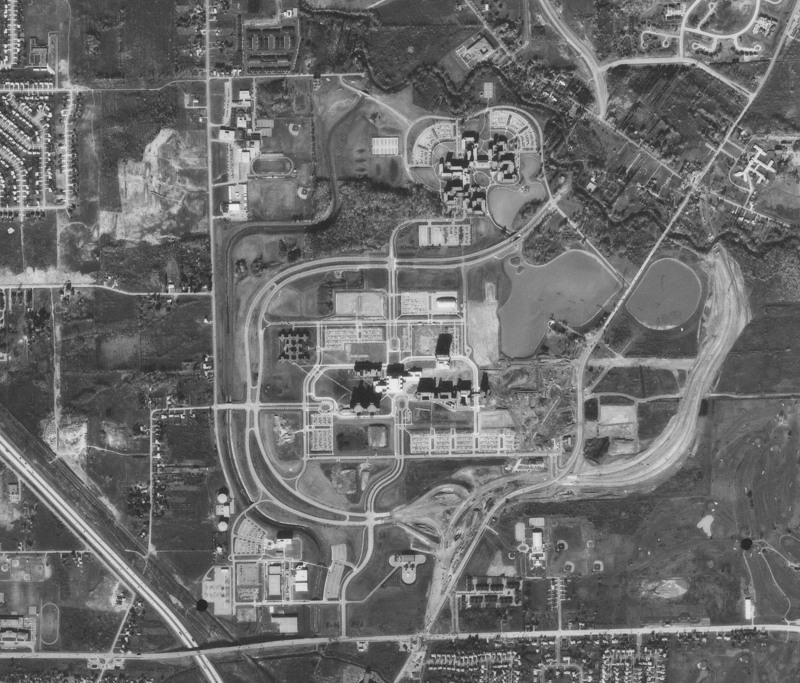 hi-res excerpt of Campus. 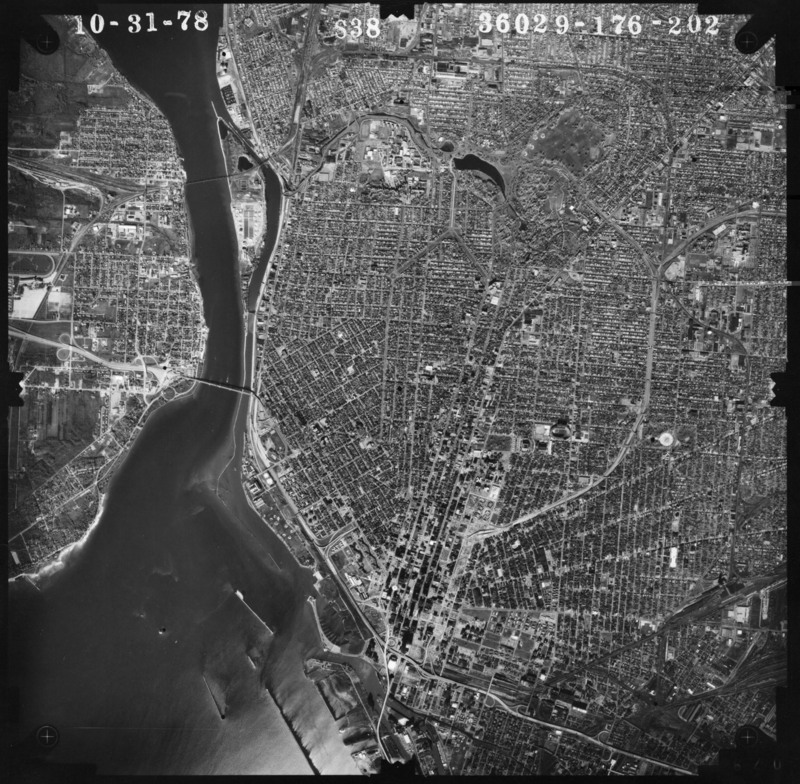 222, 223, 224 South Buffalo, West Seneca, Hamburg; N Cazenovia Park/Creek, E West Seneca (Route 400), S Milestrip Road (Orchard Park), W Lake Erie (Lackawanna) (Cazenovia Park 400%). 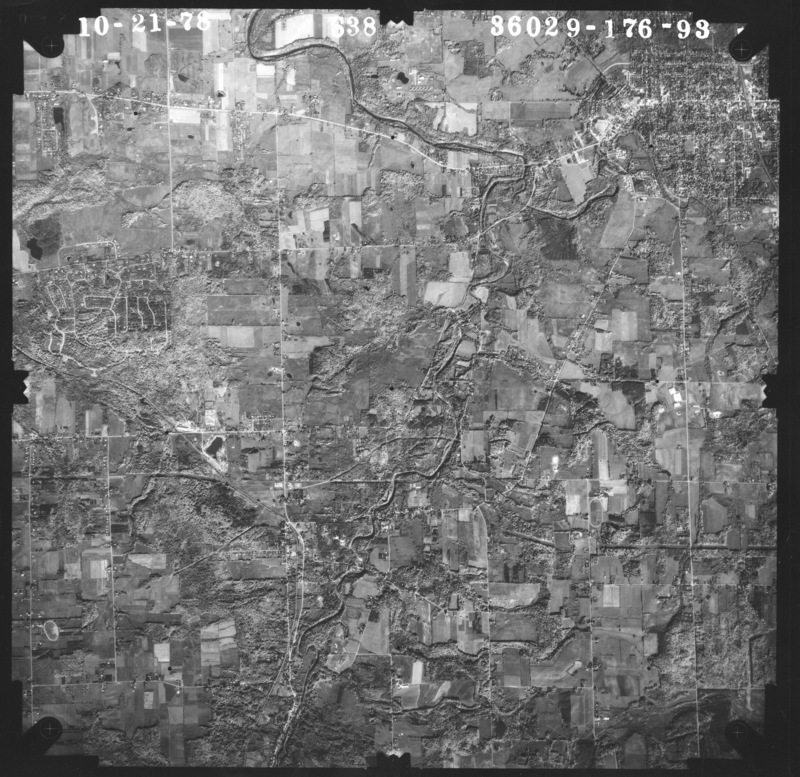 (See also: 1927, 1966 views).